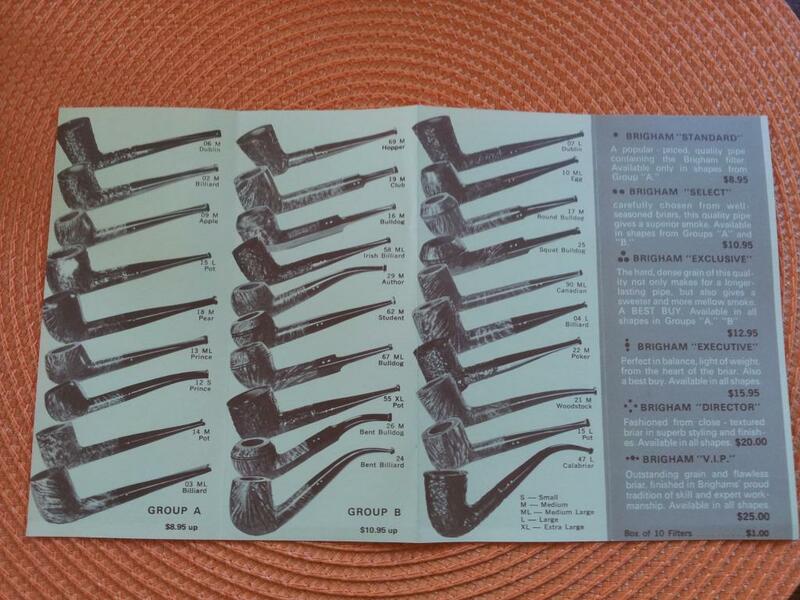 My wife and I enjoy browsing antique shops and last weekend checked out a new shop. 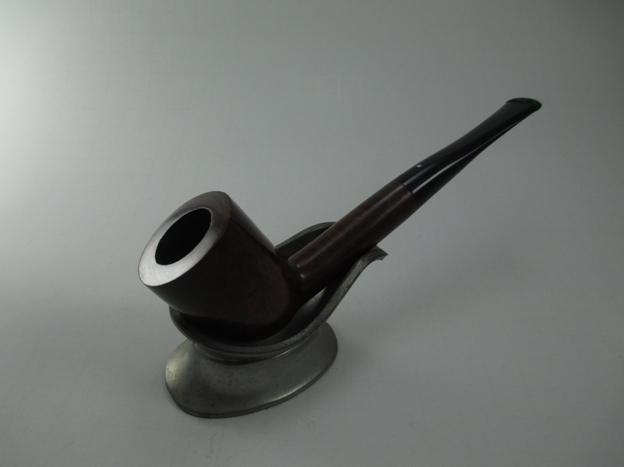 They didn’t have many pipes, most were worn out drug store pipes, but this one little pipe stood out. 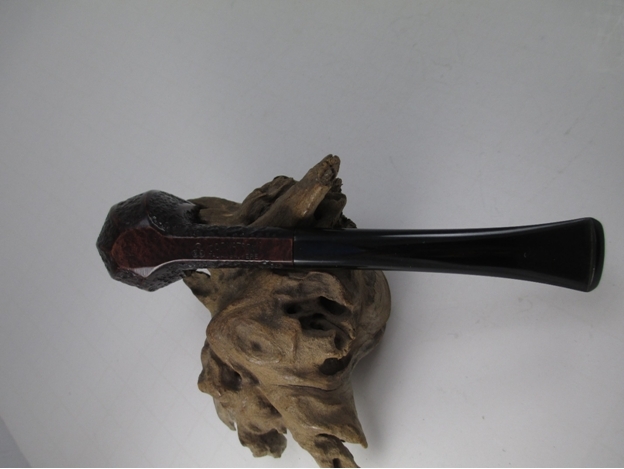 The first thing I notices was the fantail stem and interesting inlay on the stem. 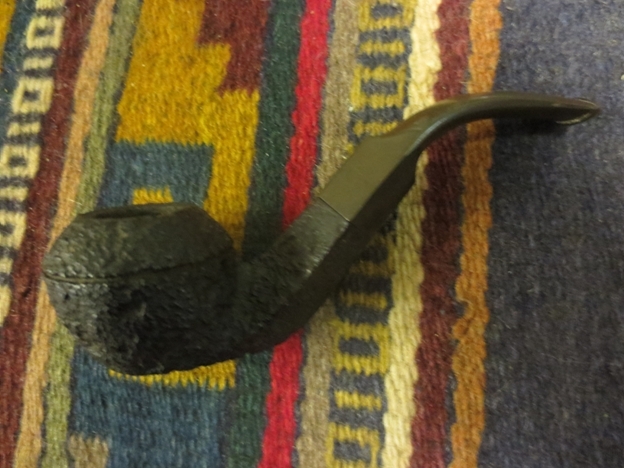 I picked it up and discovered that it was a rusticated panel billiard shape, unlike anything I’ve ever seen. 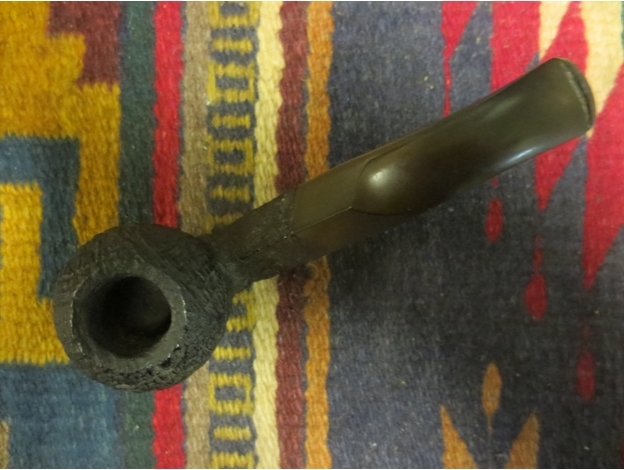 I pulled the stem from the shank and saw a very unusual stinger/tube apparatus. 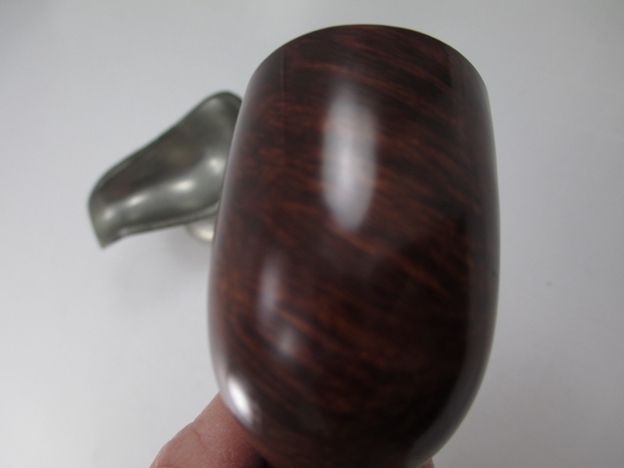 The stem looked like it was hand cut, very thin and the button had nice clean angles. 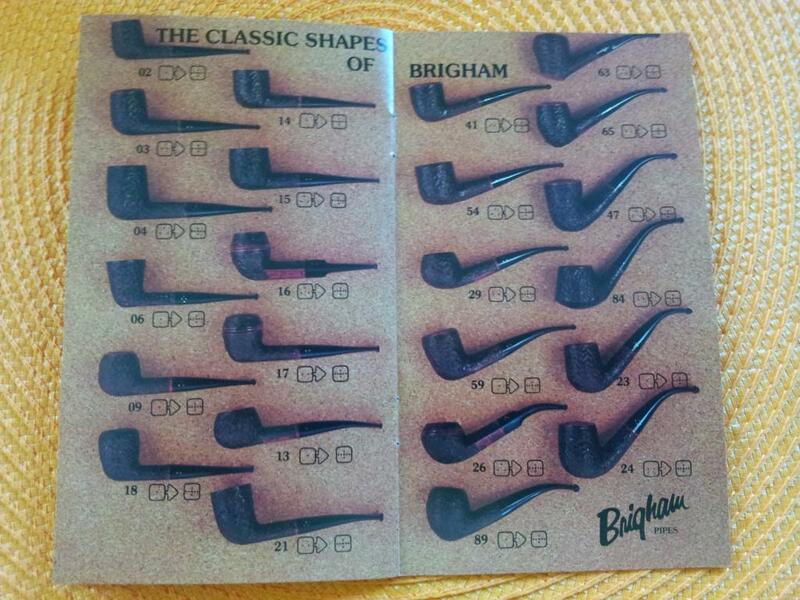 From what I found out about KB&B pipes, the clover leaf without the ampersand was from the 1930s. The best part was the price, $4.95! 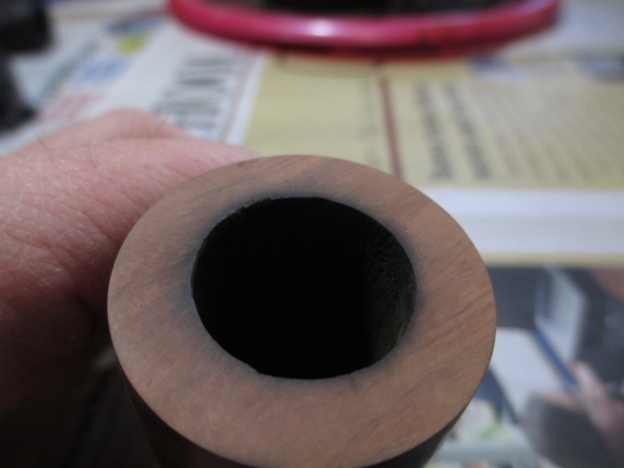 Here is what the pipe looked like, thick cake, but otherwise not too bad. 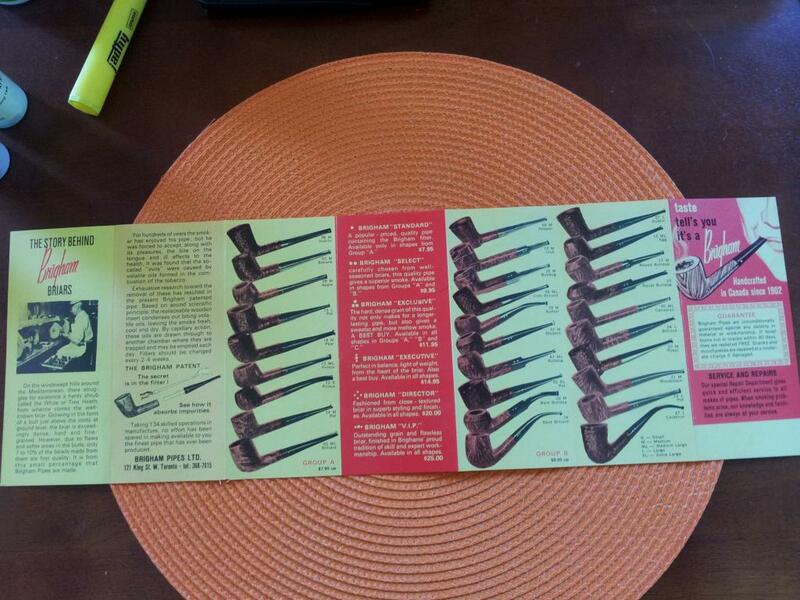 I missed some of the documentation process, but I cleaned the bowl with undiluted Murphy’s Oil Soap and a toothbrush. I decided to remove the stinger, which I accomplished with a heat gun, but still save it for the historical value. 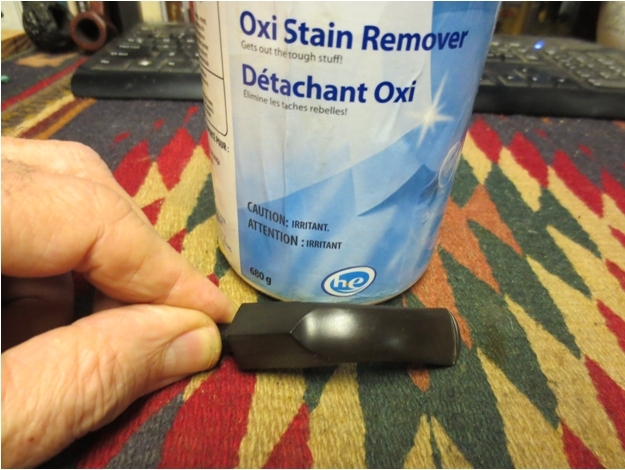 I then soaked the stem in Oxyclean. It had a lot of tar build up as you can see from this picture. Next I turned my attention to the bowl. 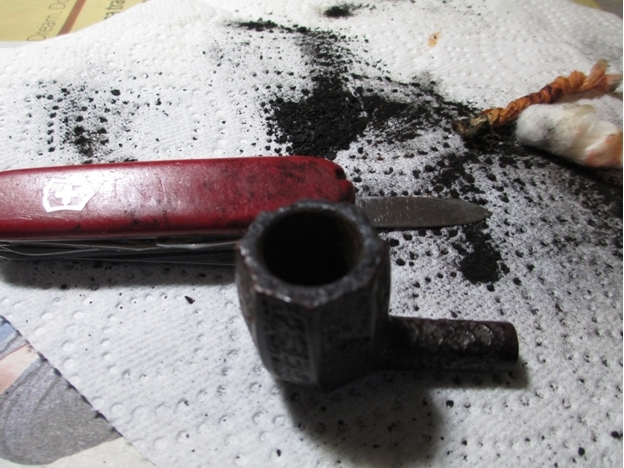 This is a very small bowl, my smallest reamer didn’t fit, so I ended up using a pen knife to carefully remove the cake. 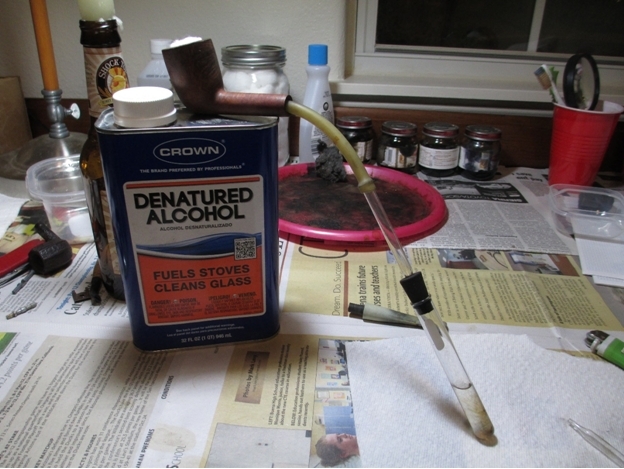 With the bowl clean and the stem started, it was time for the retort. Normally when I put cotton balls in the bowl I can fit three or four, this bowl only fits one. 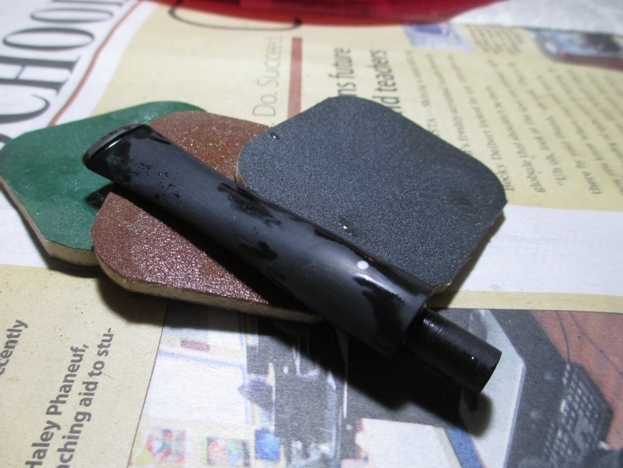 Although the stinger allowed for a lot of tar build up, it kept the shank much cleaner than most. After a few q-tips it was clean. 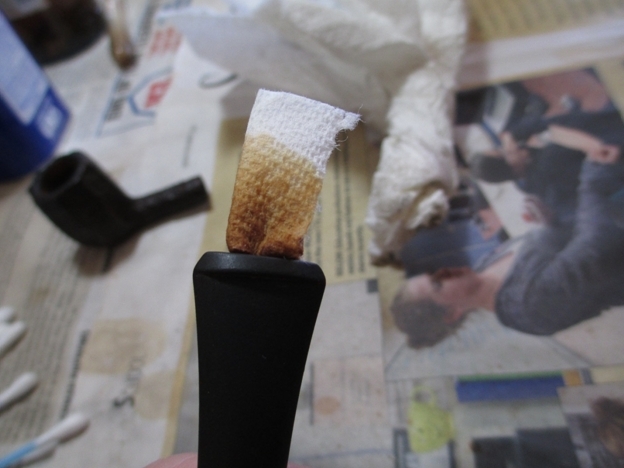 The stem was just as dirty as the shank, but the retort made the job of removing tar a breeze. 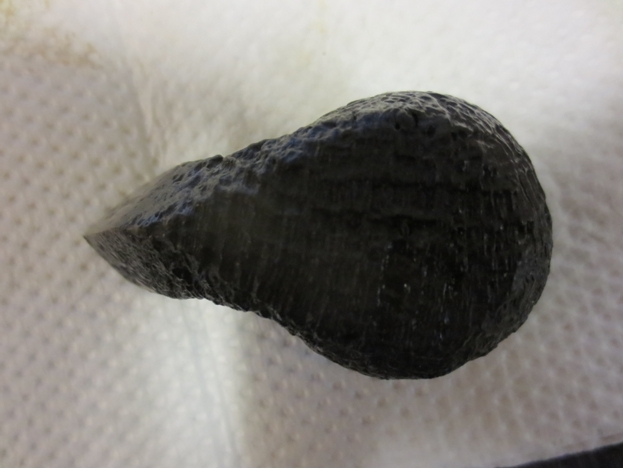 You can see from what boiled out just how much tar the stem had. 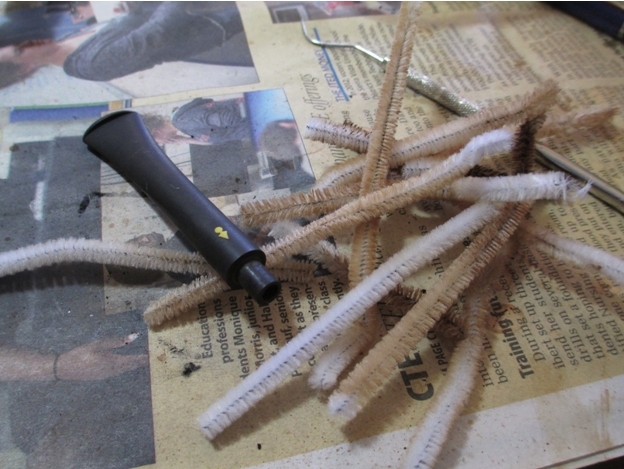 The first couple of fuzzy sticks dipped in rubbing alcohol came out very dirty, but it was mostly tar and it didn’t take long before they came out clean. 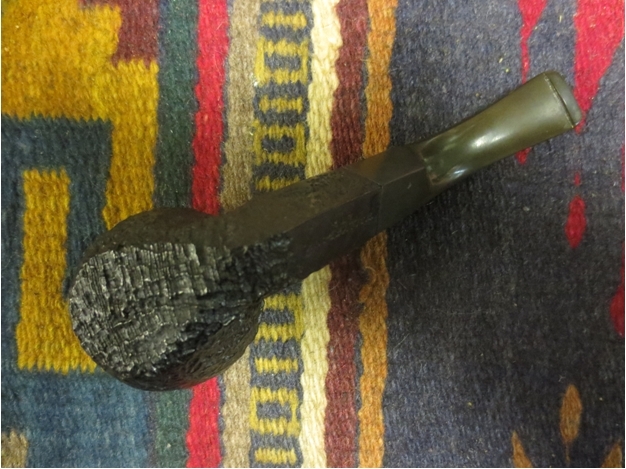 Since the outside of the bowl was already clean, I used a progression of micro mesh pads, starting at 6000 and worked up to 12,000 to polish the bottom of the shank and the high spots on the bowl. 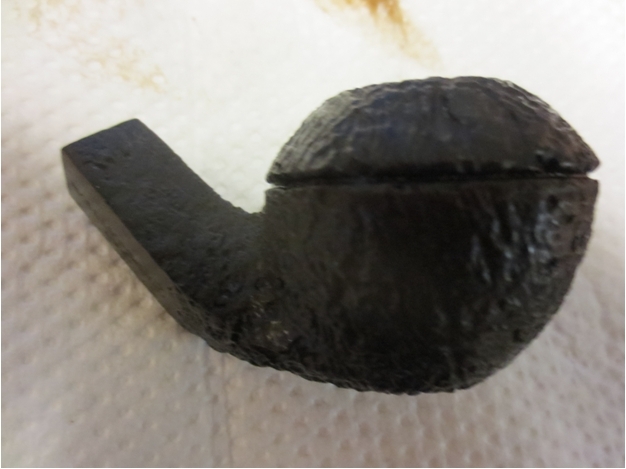 I used 400 grit wet/dry with water to remove the oxidation from the stem then switched to micro mesh pads (1500-2200) with water. 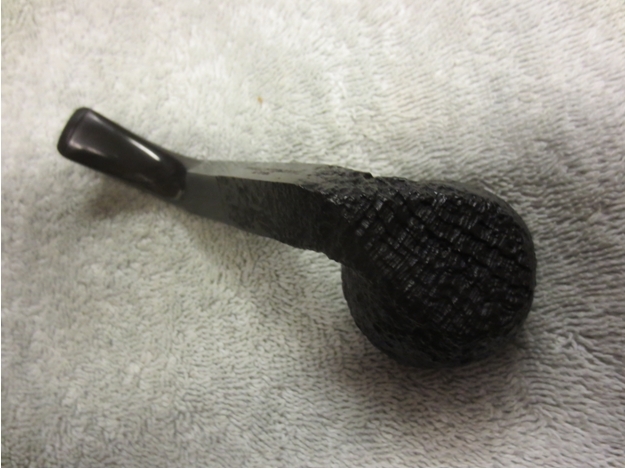 I finished the stem with the full progression of micro mesh pads through 12,000 grit to get a nice polished finish to the stem. I tried something different this time. 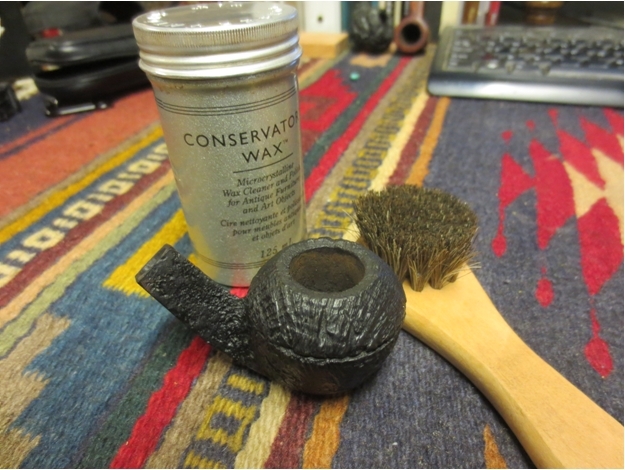 Rather than use the buffing wheel I just used the Halcyon II wax and a soft cloth. We’ll see how that holds up. 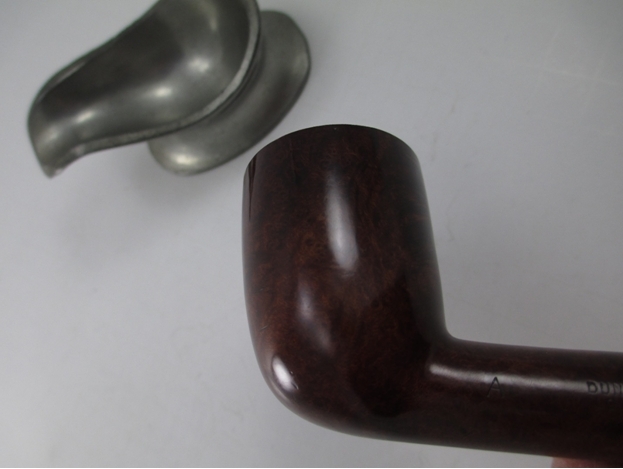 Here’s what the finished pipe looks like. 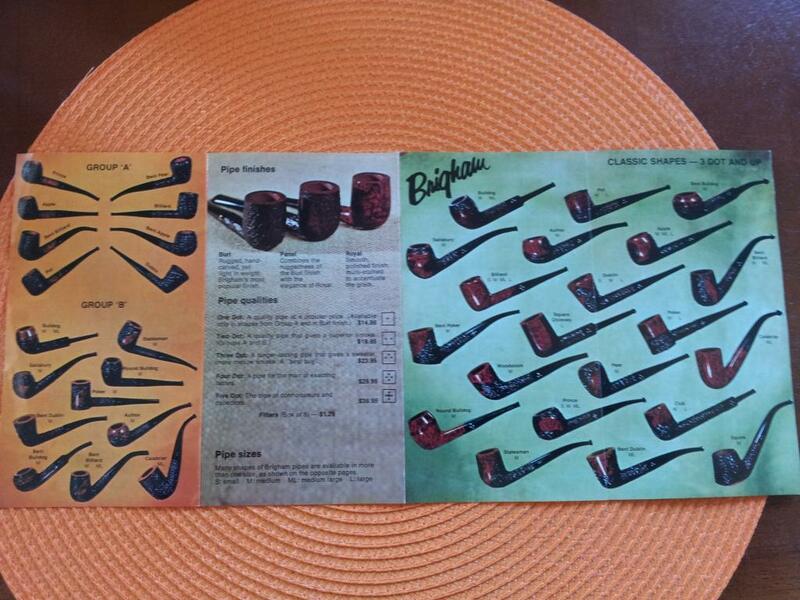 This entry was posted in Pipe Refurbishing Essays and tagged Andrew Selking articles, Articles by Andrew Selking, Bowl - finishing, KB&B pipes, KBB Doc Watson, KBB Imported Briar Pipes, micromesh sanding pads, Oxidation, pipe refurbishing, refinishing, refurbishing, Stem repairs, stem work on December 14, 2014 by rebornpipes. 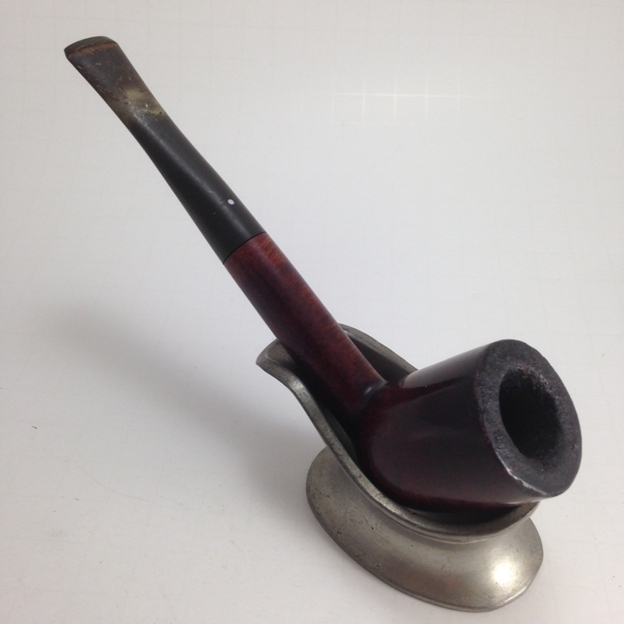 I stumbled across this Dunhill while browsing eBay. 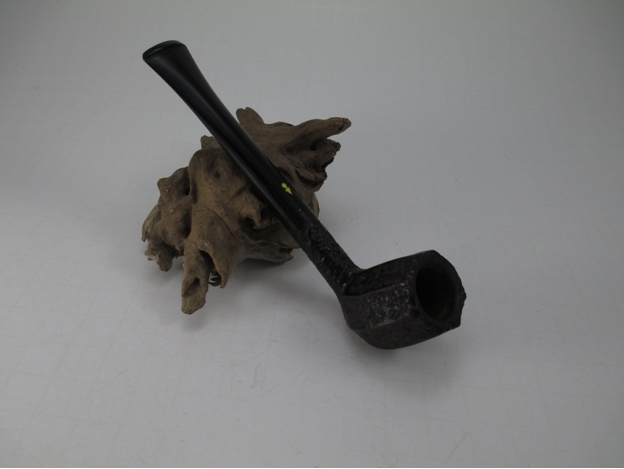 A little bit of research indicated this was a desirable patent-era pipe from the collector’s range, which used a better of briar. 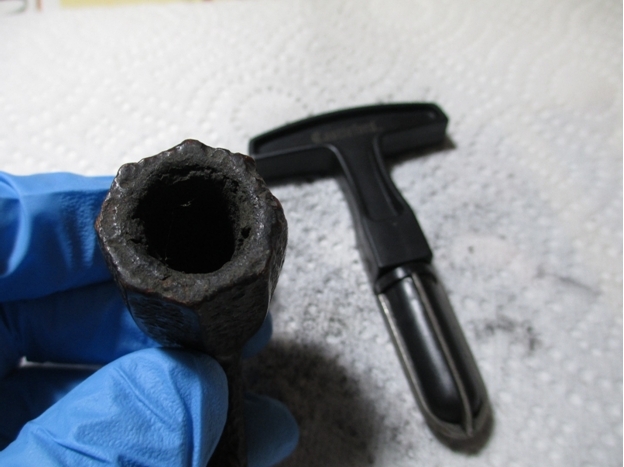 The pictures indicated a lot of tar build-up (I actually don’t mind tar, it seems to protect the rim from some of the abuse of knocking out the pipe) and some dark spots that might hide scorch marks or burn through. The stem looked decent, free of significant chatter or bite through, so I decided to take a chance. 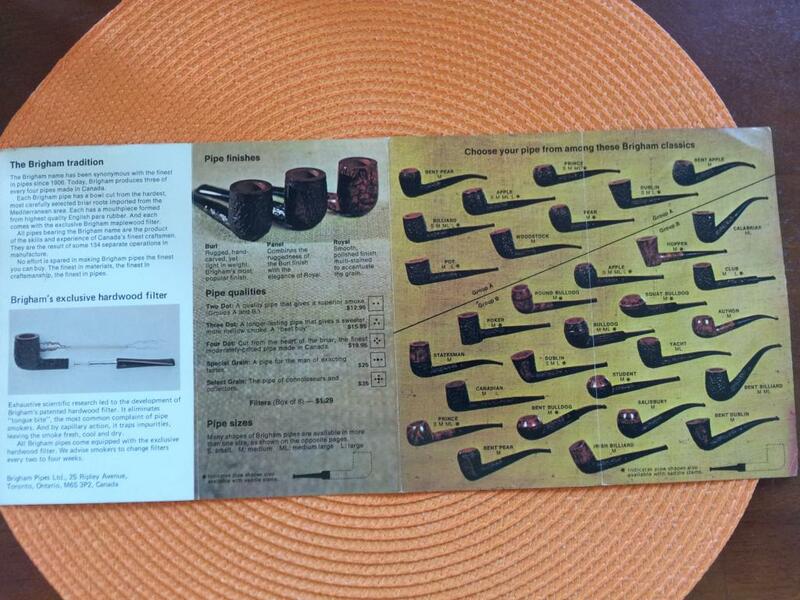 Here’s what the pipe looked like when it arrived. The first order of business was to loosen the tar and heave cake, so I dropped the bowl in the alcohol bath. 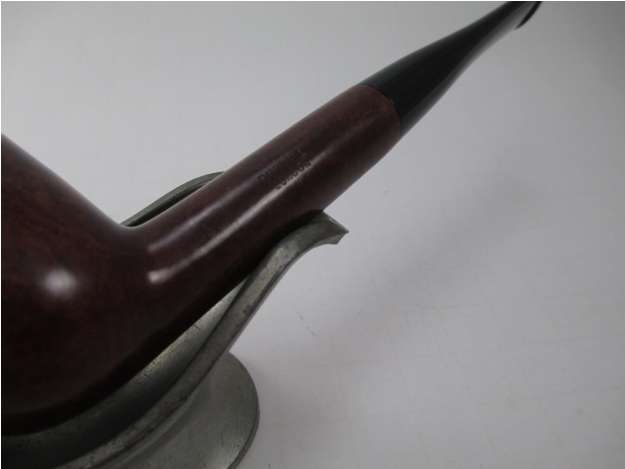 Next I turned my attention to the stem with the Oxyclean bath (yes it is taking a bath with another Dunhill stem, which I will write about later). 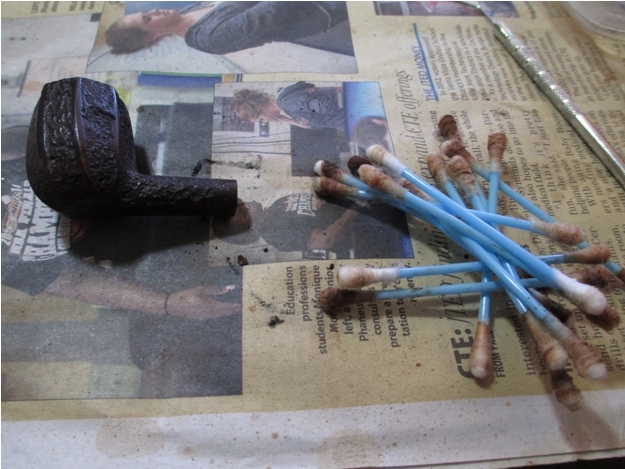 After a good long soak, I broke out my Castleford reamer and removed the cake back to the wood. 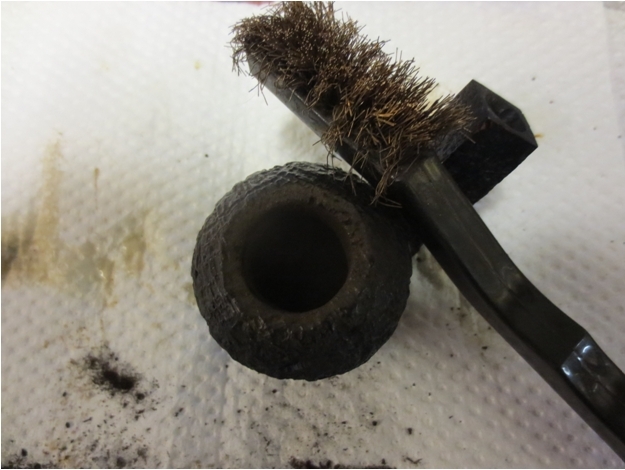 After cleaning the inside of the bowl, I used some 0000 grade steel wool in an attempt to remove the tar. Usually that works, but there was some rim damage that necessitated topping. 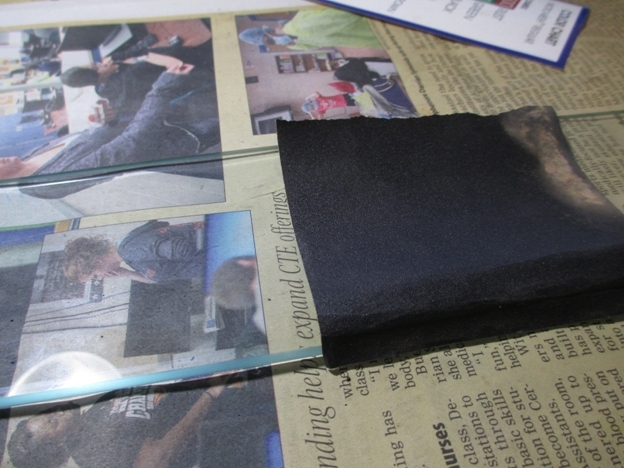 I use a piece of glass that I found to ensure an even surface when topping. I also use a relatively fine grit (400 grit) paper when doing something like this. I find that it makes the final sanding easier and I don’t inadvertently remove more than I wanted to. Here is what the bowl looked like after topping. 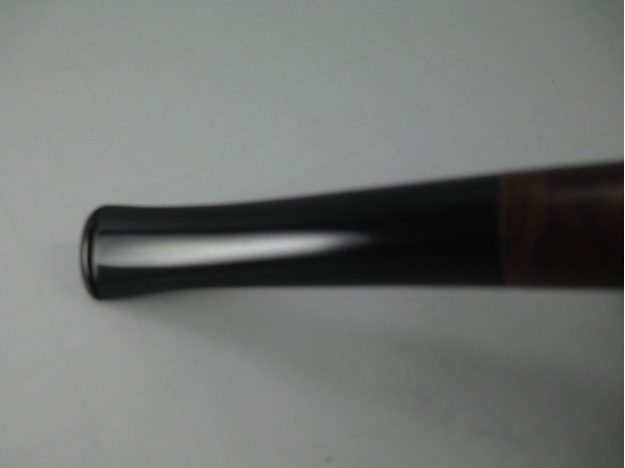 Next I tackled the inside of the shank using the retort. 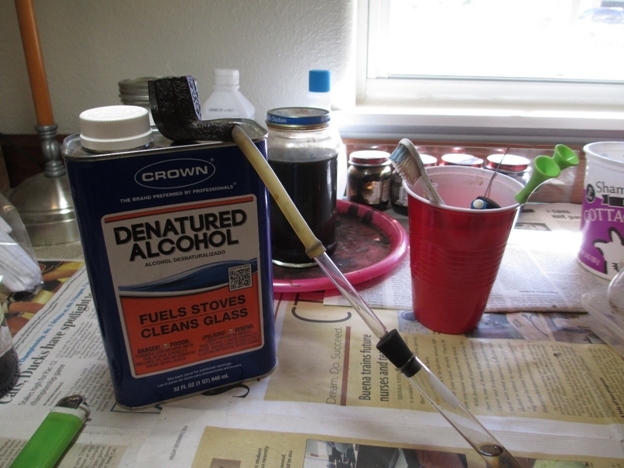 There is nothing like boiling alcohol to loosen up built up tar and tobacco. 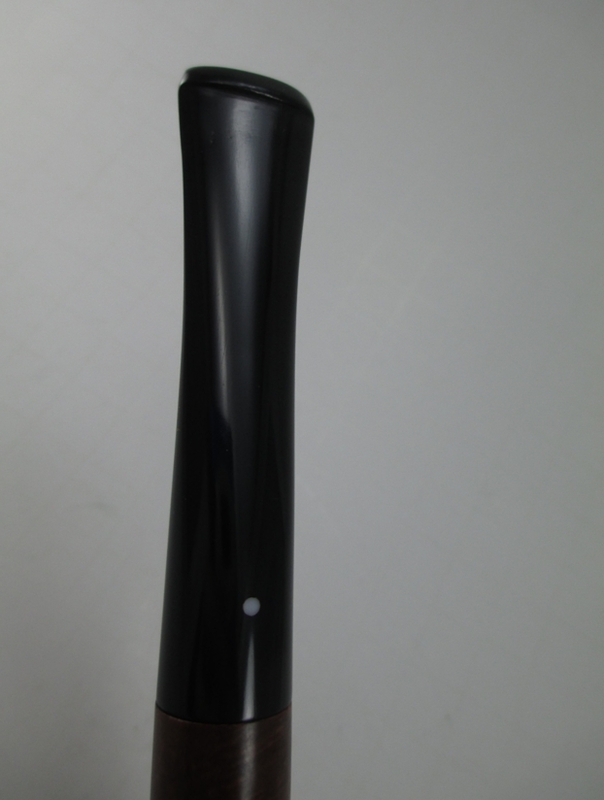 This is what the brush looked like after the first pass. In case you’re wondering what I do to clean the brush in between passes, I swish it in the jar I use for soaking the bowls. The sediment settles to the bottom and since soaking in alcohol is only one step in the process, I don’t worry too much about it. 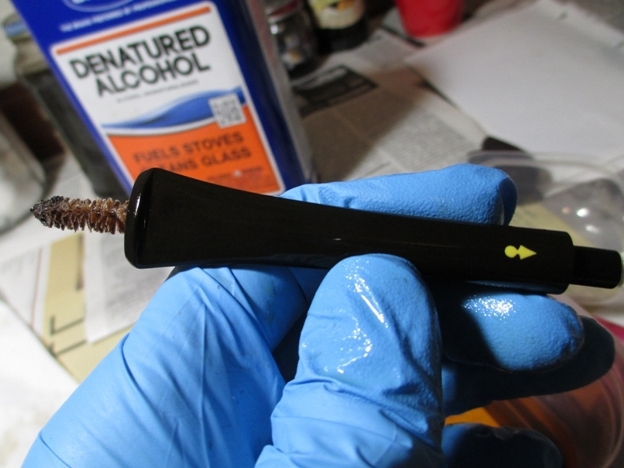 Once the brush no longer captured a bunch of gunk, I moved on to q-tips dipped in rubbing alcohol. 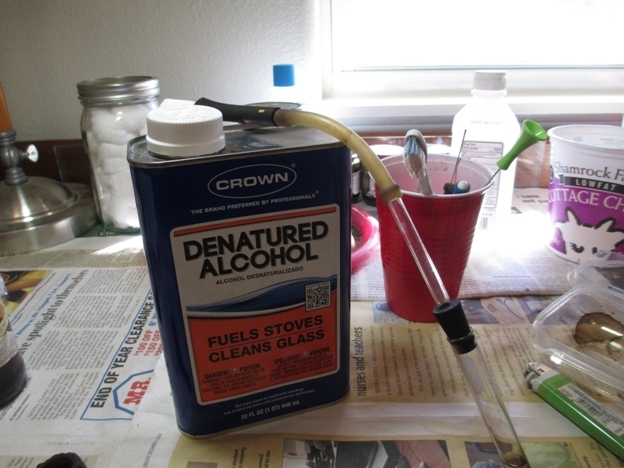 In my opinion, rubbing alcohol works fine for general cleaning, but it does not work well for mixing with stain or for doing the retort. 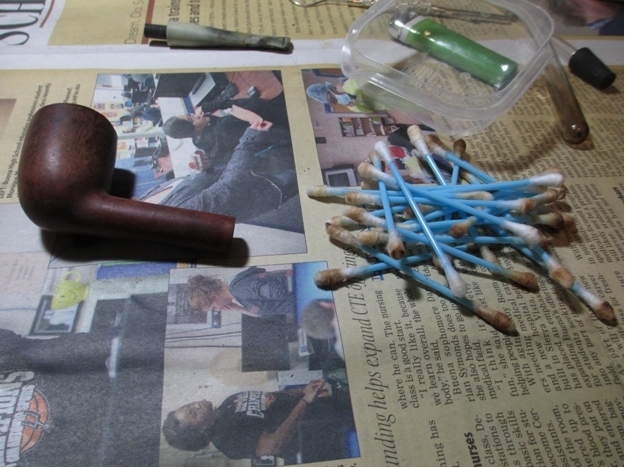 As you can see, it took a good amount of q-tips before the shank came clean. Next I used the retort on the stem. 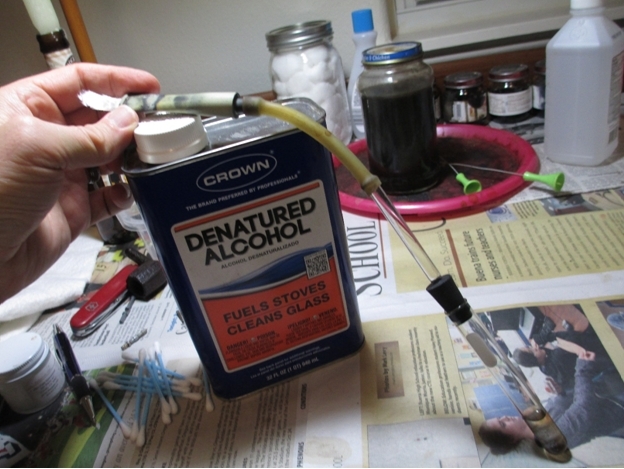 As always, I made sure to plug the end to ensure the dirty alcohol didn’t boil over and shoot out the end (that’s always hard to explain to your significant other). 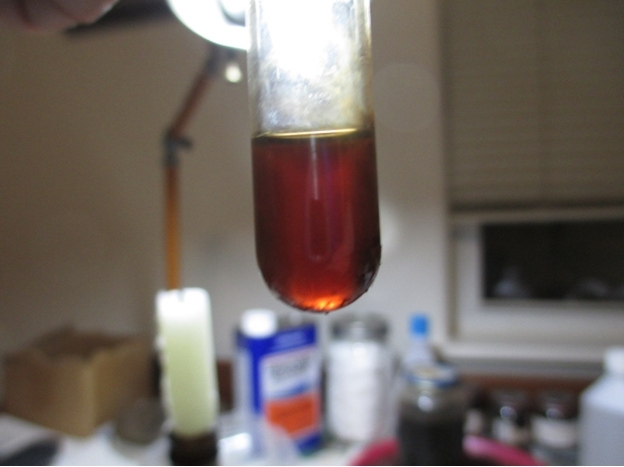 The stem was pretty nasty, as you can see from the residual alcohol in the test tube. 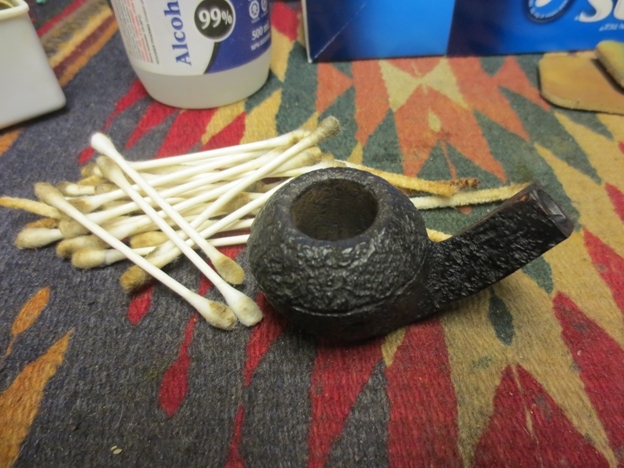 After using a pile of fuzzy sticks (I get them in the craft section at Wal Mart, they’re cheaper than pipe cleaners and longer), the inside of the stem was finally clean. 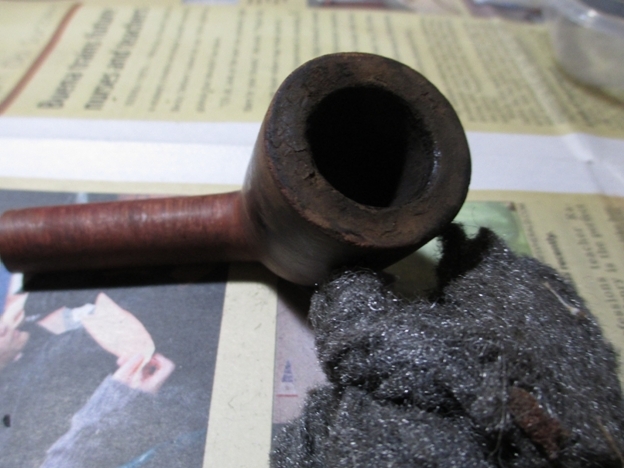 Starting with the stem, I used 400 grit wet/dry sandpaper with water to remove the oxidation. 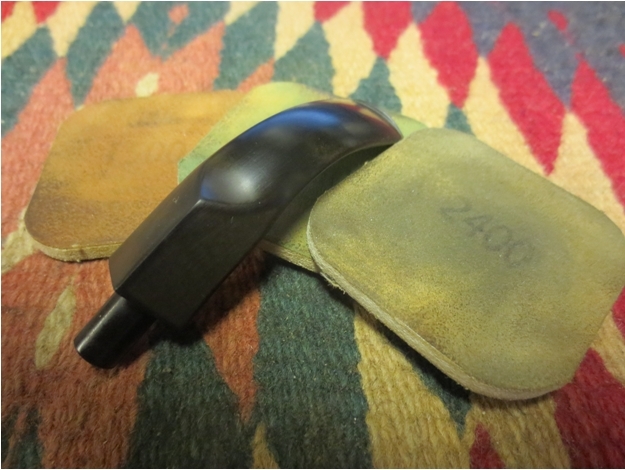 I then moved on to 1500-2400 grit micro-mesh pads with water. 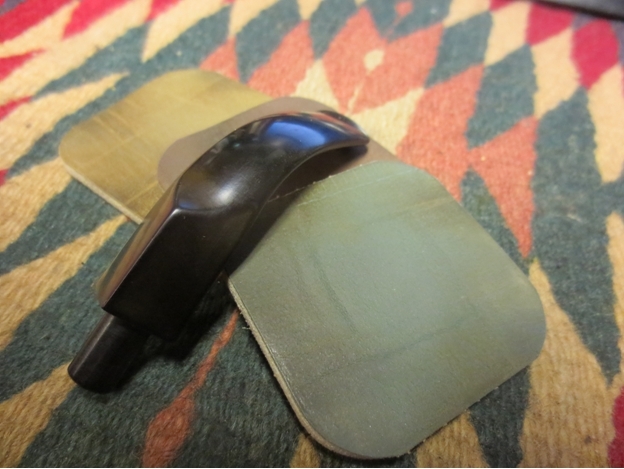 I find that the wet sandpaper does a good job getting into the little crease on the underside of the button. 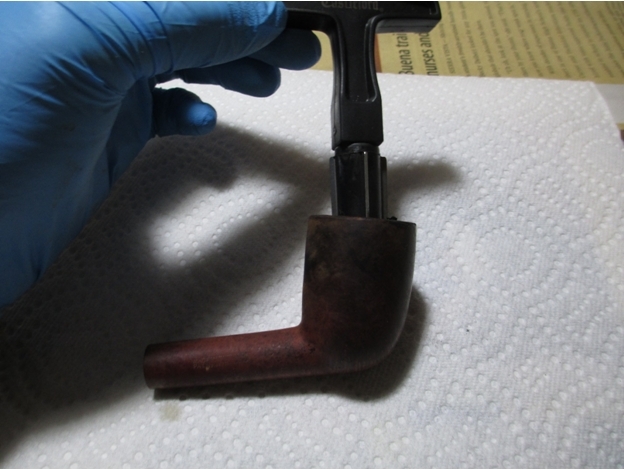 It’s also helpful to occasionally dry the stem off and see if there’s still any oxidation left, it’s easy to overlook when the stem is wet. 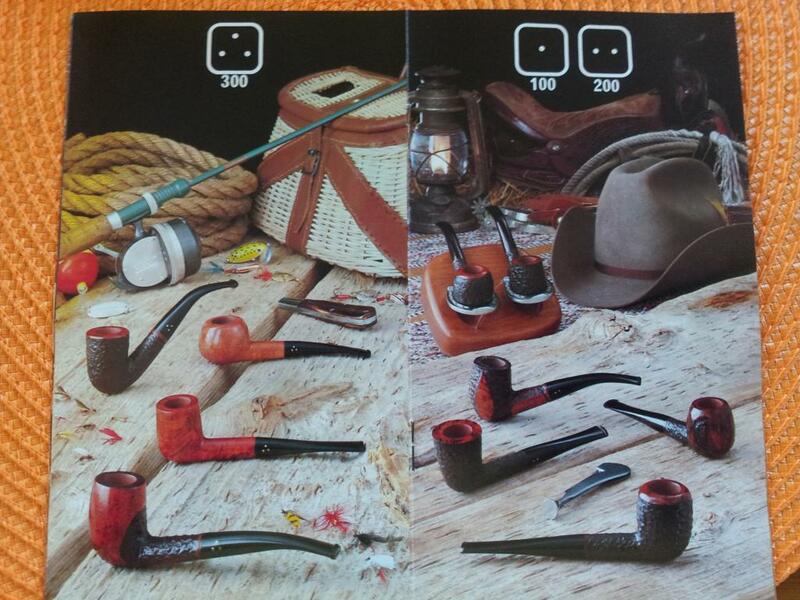 I use the same progression of micromesh on both the bowl and the stem, although I don’t use water with the bowl. 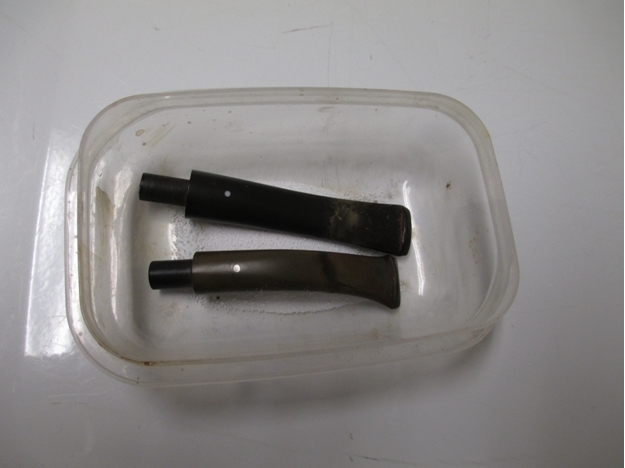 Here is the pipe after going through the entire progression 15000 through 12,000. 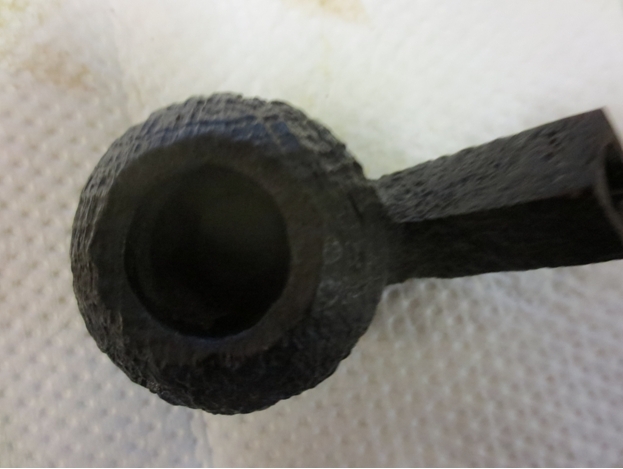 I stained the bowl with Pimo Pipe Supply’s mahogany stain, diluted with denatured alcohol and flamed to set. 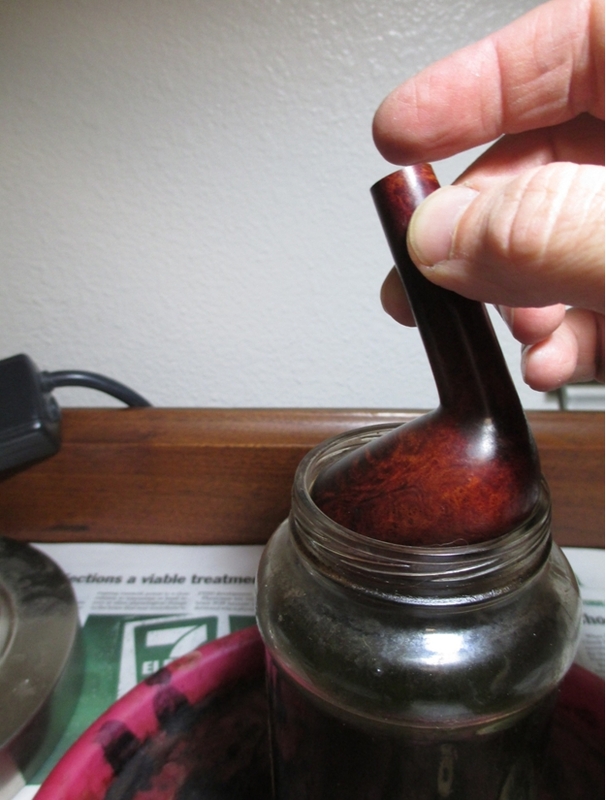 Next I took the bowl and stem to the buffing wheel, where I used some white diamond and a couple of coats of carnauba wax. Here is the finished result. 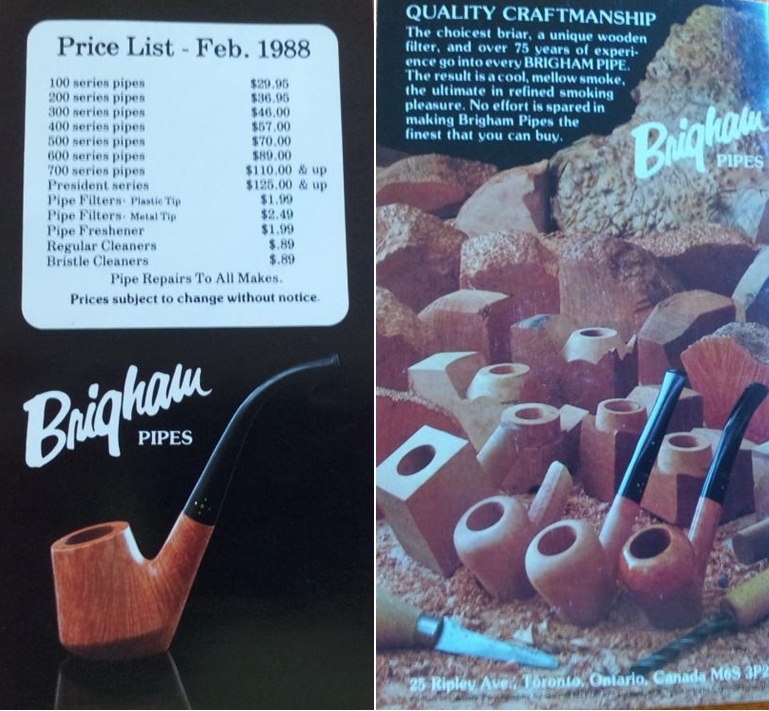 This entry was posted in Pipe Refurbishing Essays and tagged Andrew Selking articles, Articles by Andrew Selking, Bowl - finishing, Bowl - refinishing, contrast staining, Dunhill Patent Era 137, Dunhill Patent Era Pipes, Dunhill Pipes, finishing, micromesh sanding pads, Oxidation, refinishing, refurbishing, removing oxidation, restaining, restaining a bowl and rim, staining, stem work, topping a bowl on December 14, 2014 by rebornpipes. 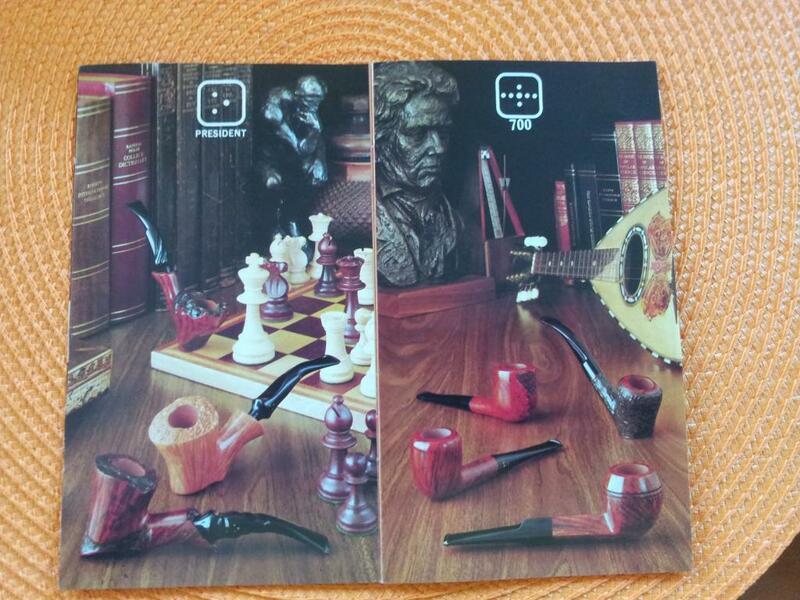 Every once in a while I get the urge to just sit and work my way through the estate pipes on the various Ebay sites. I rarely if ever pick anything up anymore unless it is something that is unique and just grabs me. The last time I did the scan of the various sales I came across this old Wally Frank sitter. 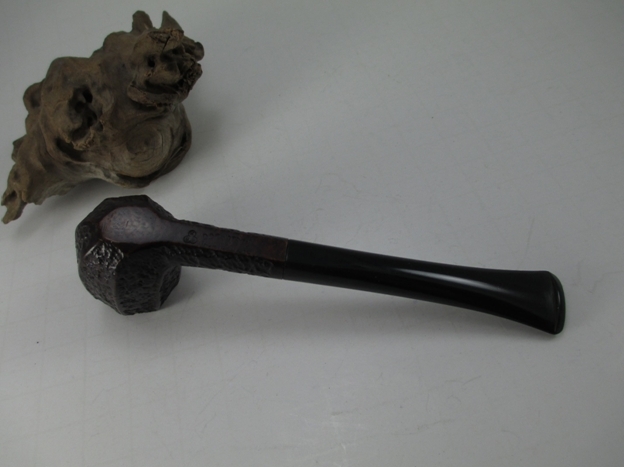 It combined the look of a Rhodesian with a diamond shank like a Bulldog and a sitter base. 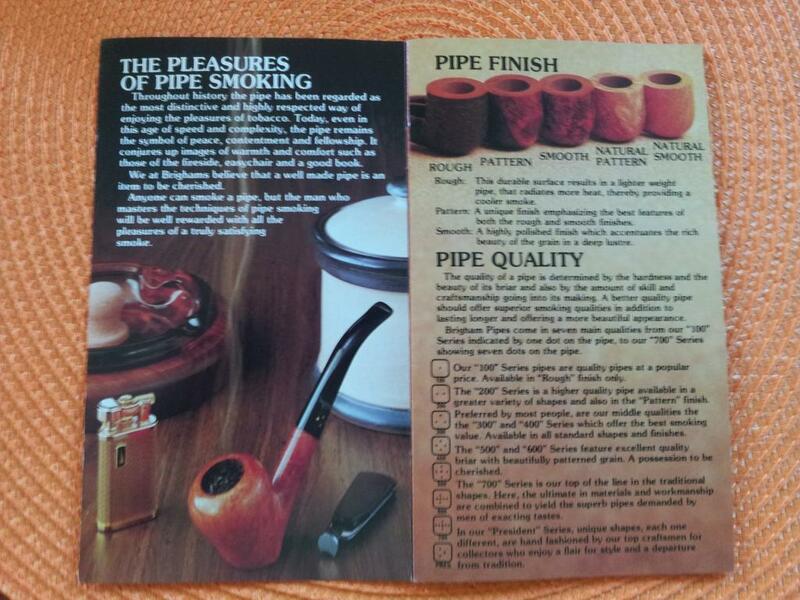 It had a very English made pipe look in my opinion. 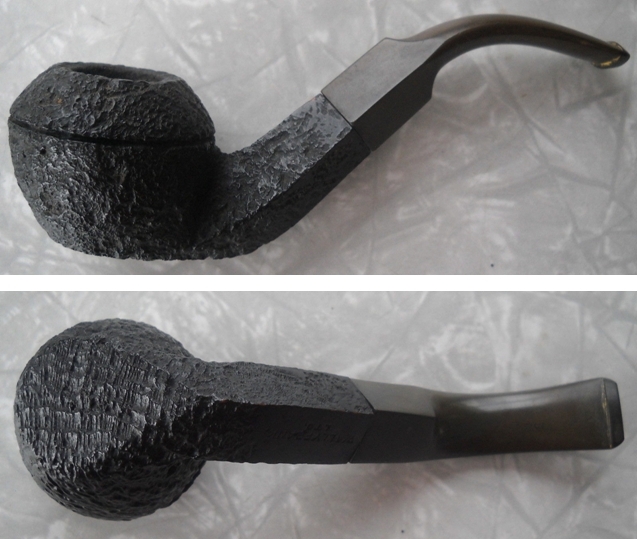 The sandblast on the bowl and front portion of the shank appeared to be deep and craggy. 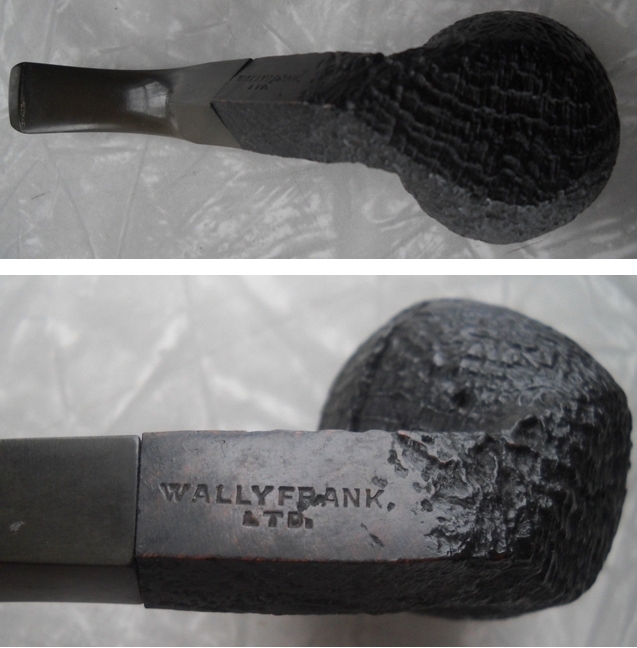 The rustication of the last third of the shank, a feature that I find often on sandblasted Wally Frank pipes, looked good and the stamping was clear and readable. The bowl appeared to be in decent shape and finish looked good in the photos. 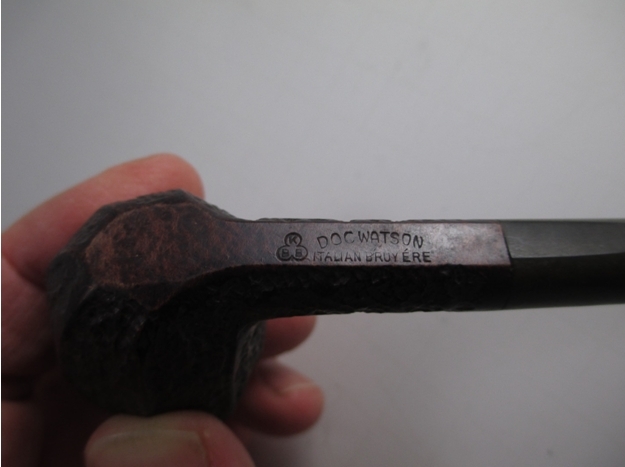 The stem was oxidized and the seller noted that it sat off centre slightly or did not line up with the shank. 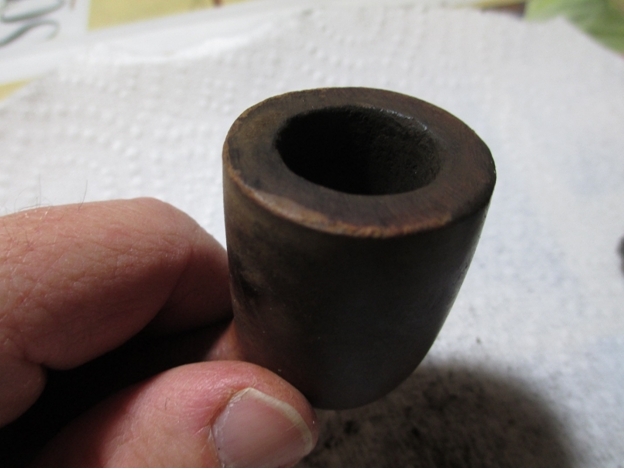 I figured if it had a metal tenon that was fixable and if it was a push tenon it was a non-issue. I was hooked. I bid on it and won, only to find out that the shipper never shipped out of the US. We corresponded and he decided to send it on to me. For that I thank him. 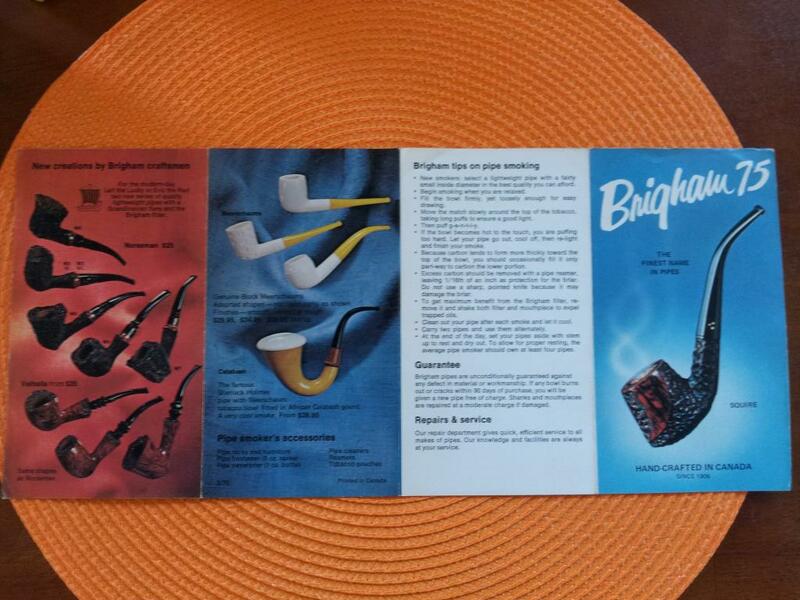 The next series of six photos were included by the seller in the Ebay write-up. 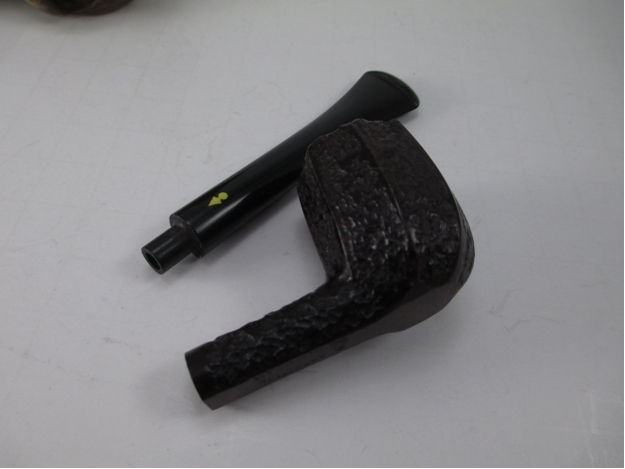 When the pipe arrived, I opened the box and removed the pipe. The blast was even better than the photos had shown. 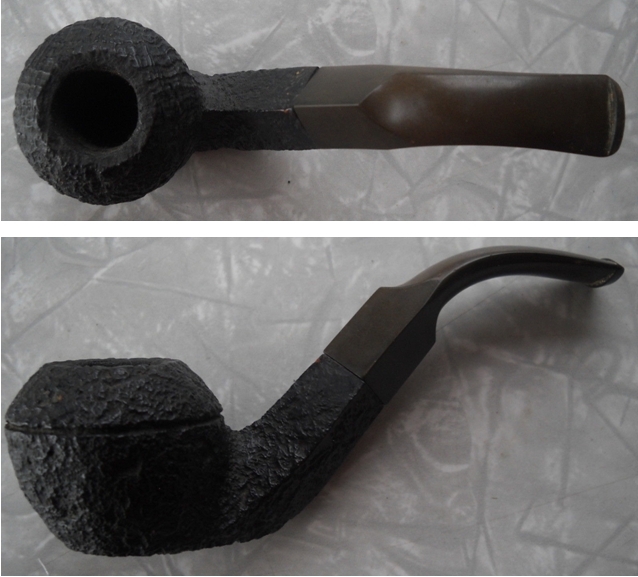 The stem oxidation was pretty much as shown above. 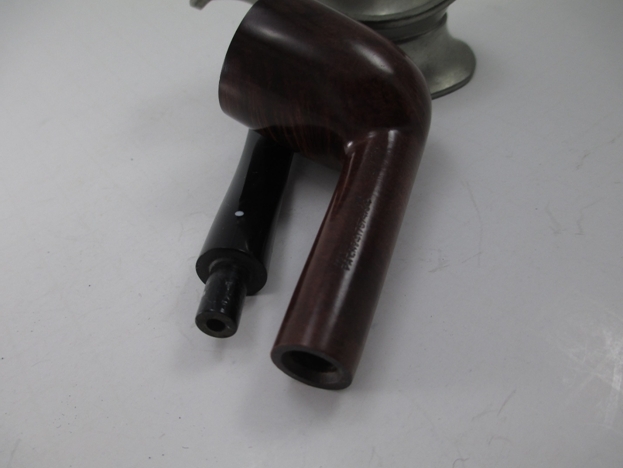 The misaligned stem was no issue as the stem had a push tenon and was only a matter of turning the stem slightly. The airway was open but dirty with tars and grime. The bowl had a light cake that thickened toward the bottom of the bowl. 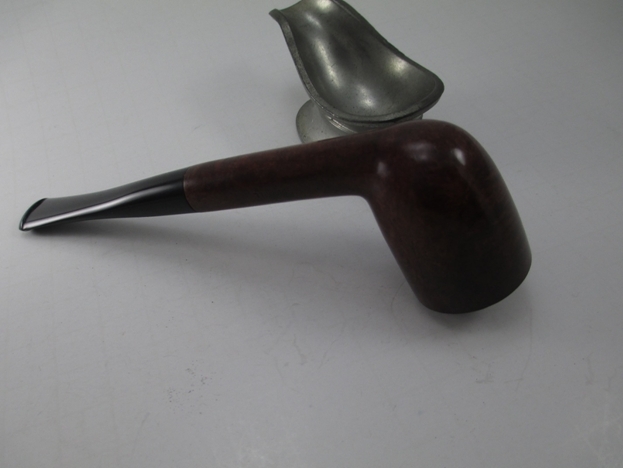 The edges of the shank and the stem were sharp and clean showing that it had not been buffed much in its history. 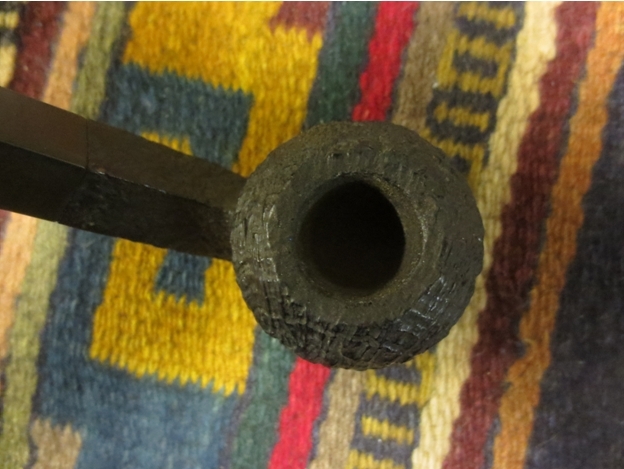 There were a couple of spots on the edge of the rim and shank at the union next to the stem where the stain was worn or missing. The rim itself was dirty with tars. 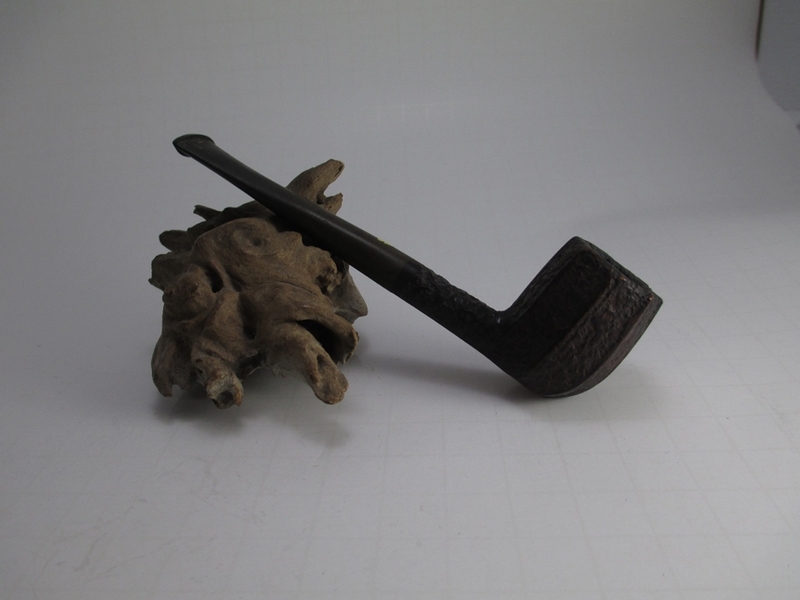 The stem was clean though oxidized with no tooth marks or chatter. 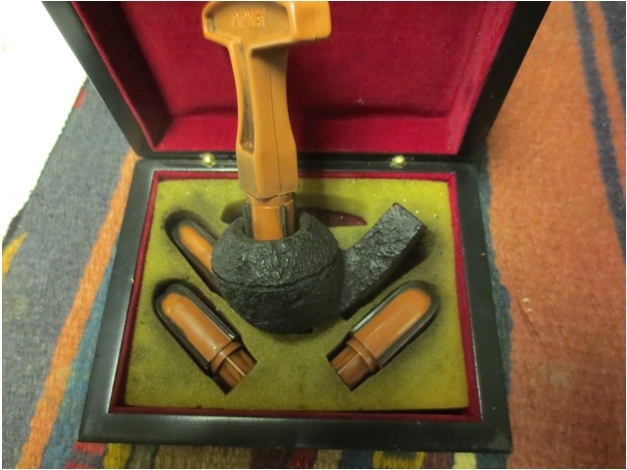 The button was crisp and sharp and the slot was an open oval that flared into the stem opening up into the airway like a funnel. 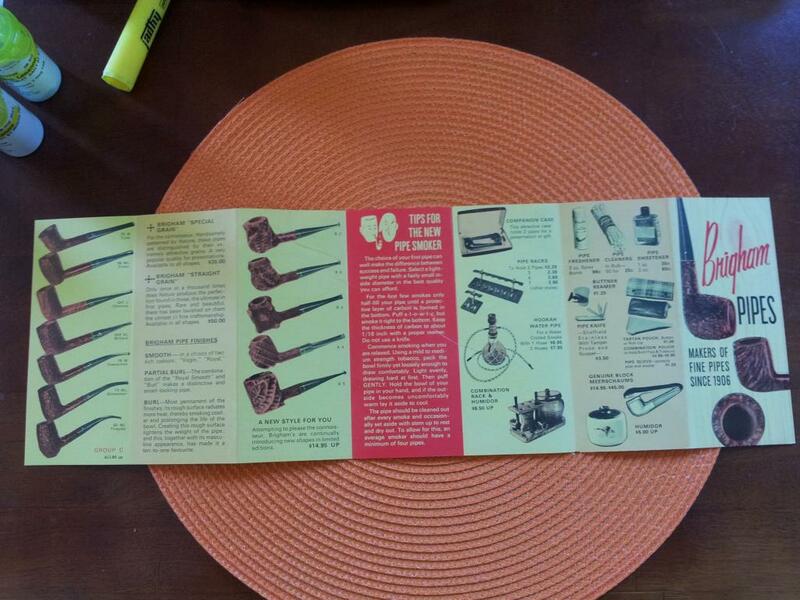 I took a few photos of the pipe when I took it out of the box. The photo below shows the situation with the cake in the bowl. 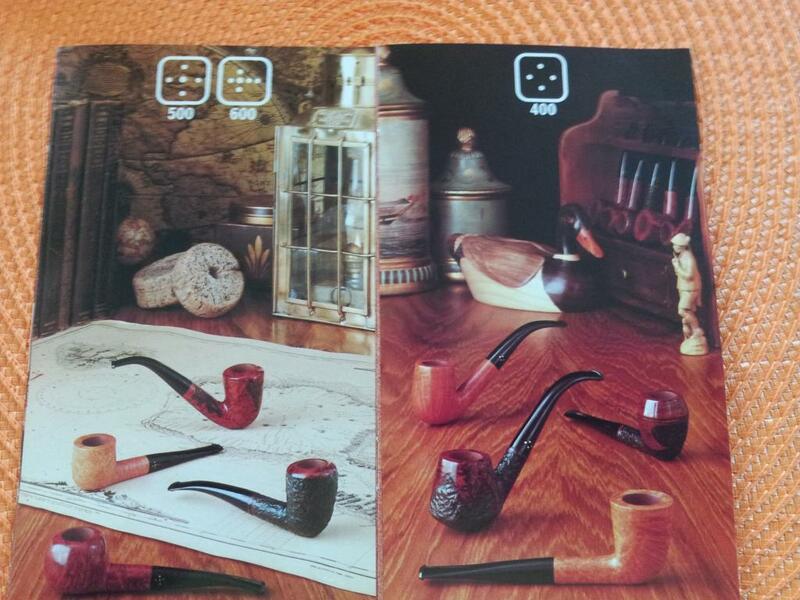 It was not centered or evenly built up around the bowl so it would need to be cleaned up and adjusted. 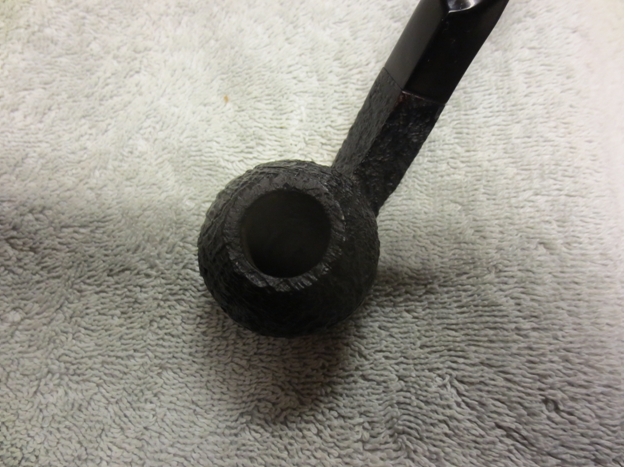 I reamed the bowl with a PipNet reamer and took the uneven cake back to bare wood. I used the smallest cutting head to begin with and worked my way up to the second cutting head. With these two I was able to clean out the cake. 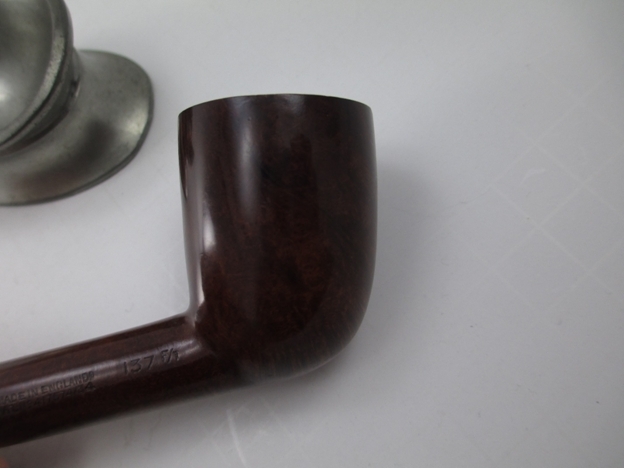 The bowl shape is kind of combination of a V and U shape. 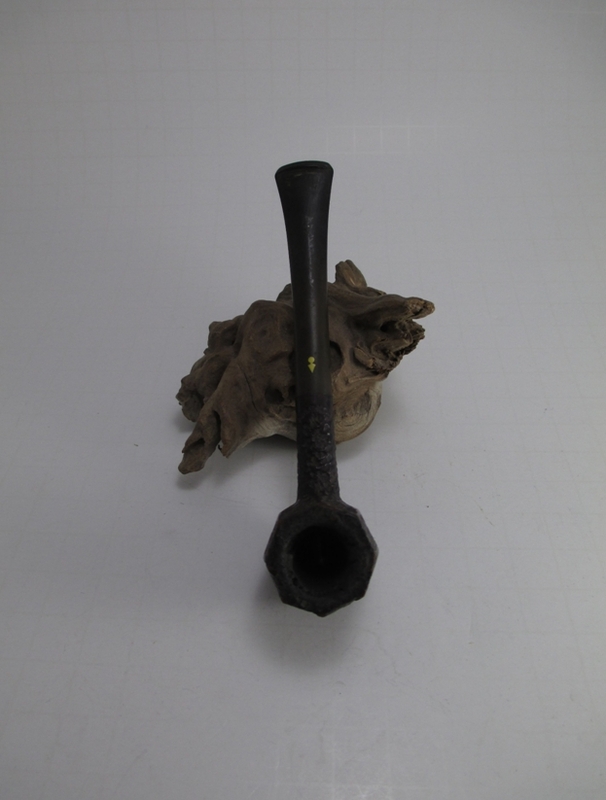 The sides are U-shaped to about a half-inch from the bottom of the bowl where it shifts to a V shape. 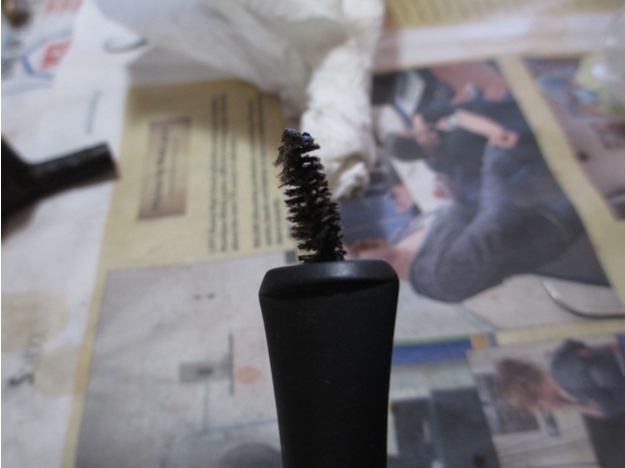 I scrubbed the rim surface with a soft bristle brass tire brush to clean off the tars and oils built up there. 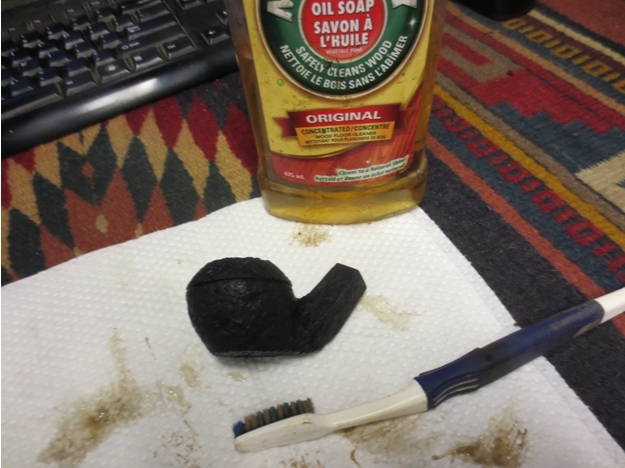 I scrubbed the bowl and rim with Murphy’s Oil Soap and a tooth brush. Once I had scoured it with the soap I put a thumb over the bowl and rinsed off the soap with running water. 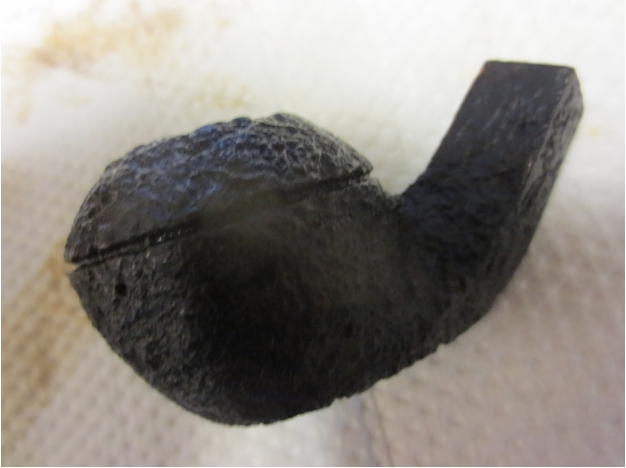 The photos below show the pipe after I had scrubbed, rinsed it and dried it off with a soft cloth. 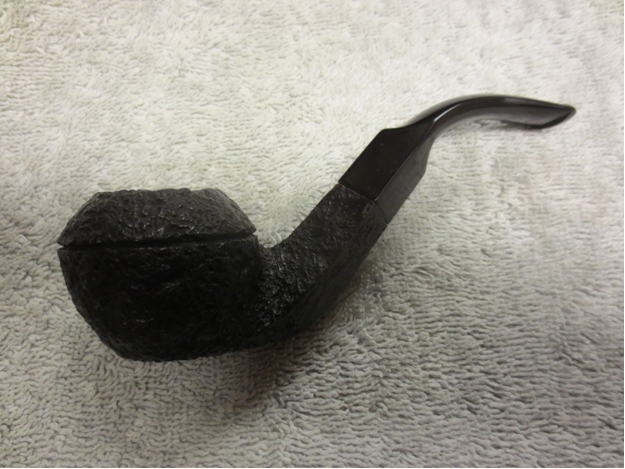 After cleaning the briar I gave it a coat of Conservators Wax which is a microcrystalline wax cleaner. 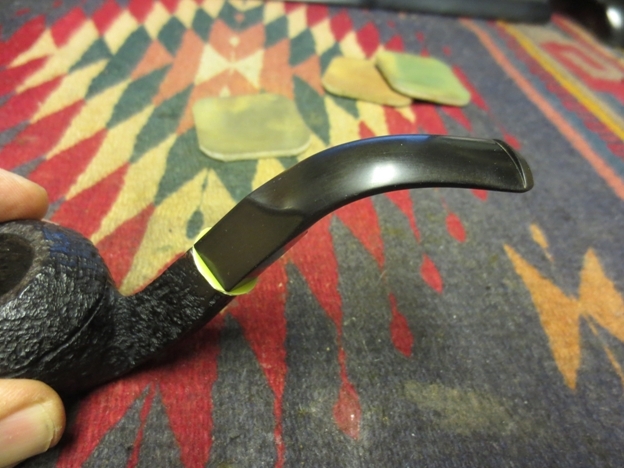 I buffed it with a shoe brush to bring a shine to the bowl. 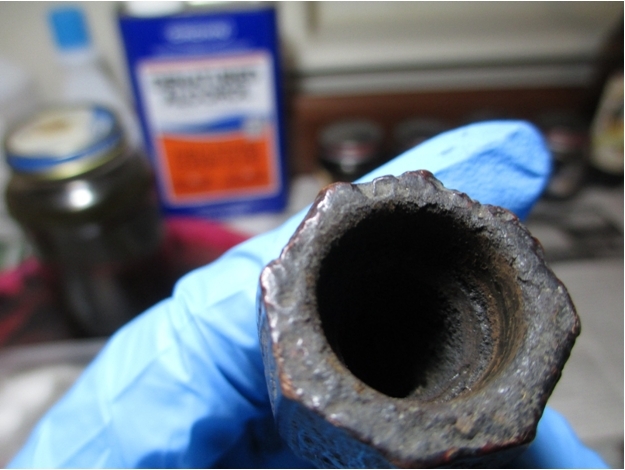 I put the stem in a jar of Oxyclean to soak and raise the oxidation to the surface. I let it sit overnight to soak. I then returned to the inside of the bowl. 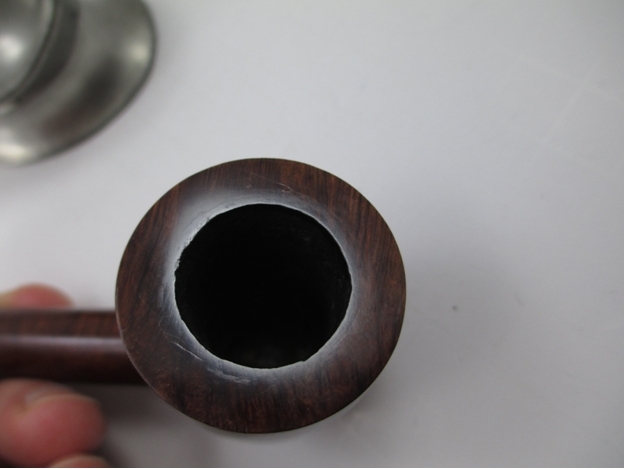 (NOTE: The reason I give the bowl a coat of wax before cleaning the inside of the shank and bowl is because I want to protect the finish when I am cleaning out the inside). 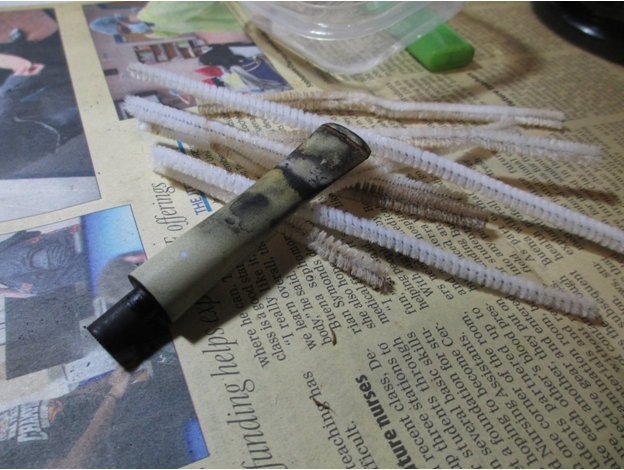 I cleaned out the shank with isopropyl alcohol and cotton swabs and the airway with pipe cleaners. I cleaned it until the cleaners came out with no grime on them. 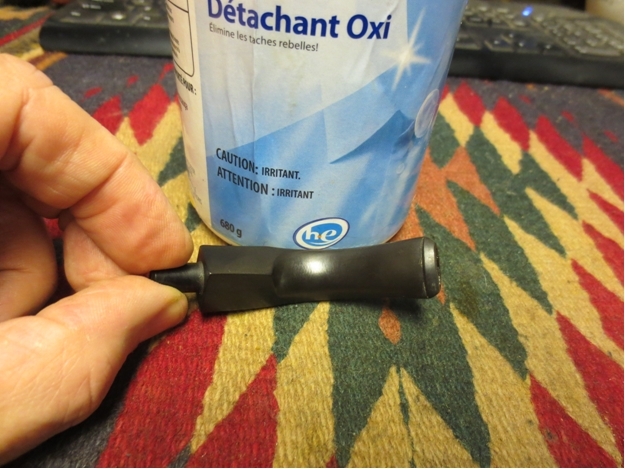 In the morning I took the stem out of the oxyclean and dried it off with a paper towel. 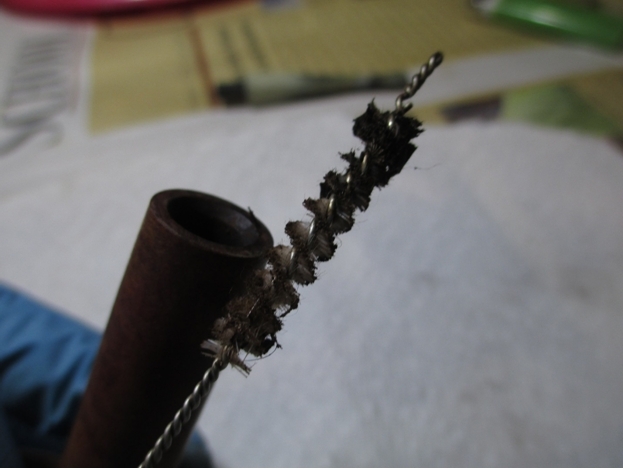 The roughness of the paper towel removes the oxidation that has been raised to the surface of the stem. 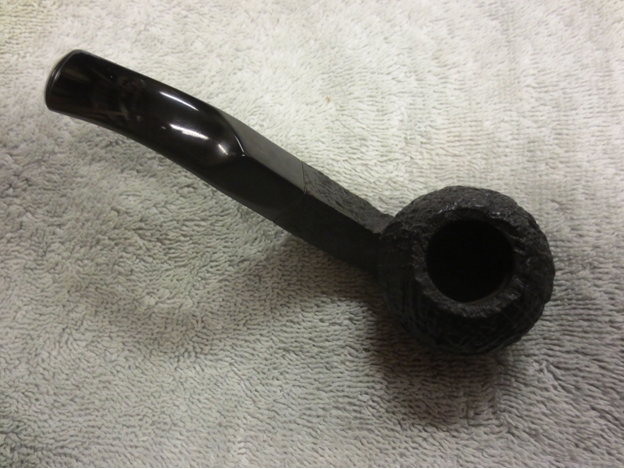 Once it was dry I slipped a plastic washer on the tenon and reinserted it into the shank of the pipe. The washer allows me to sand all the way to the edges of the stem without rounding the edges at the shank junction. 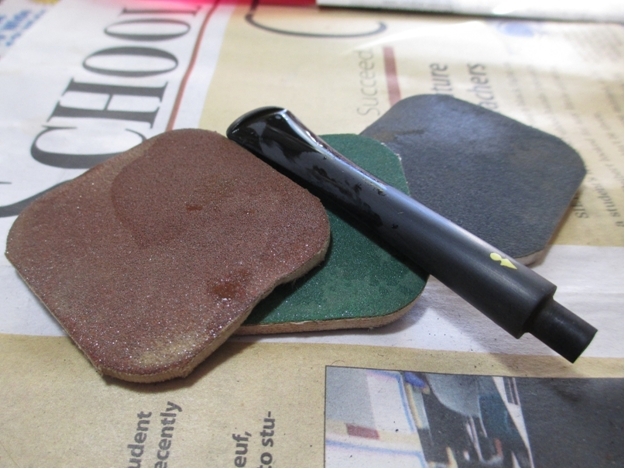 I started with a medium grit sanding sponge and worked through a fine grit sponge and fine grit sanding block. I then wet sanded with 1500-2400 grit micromesh pads and dry sanded with 3200-12,000 grit pads. 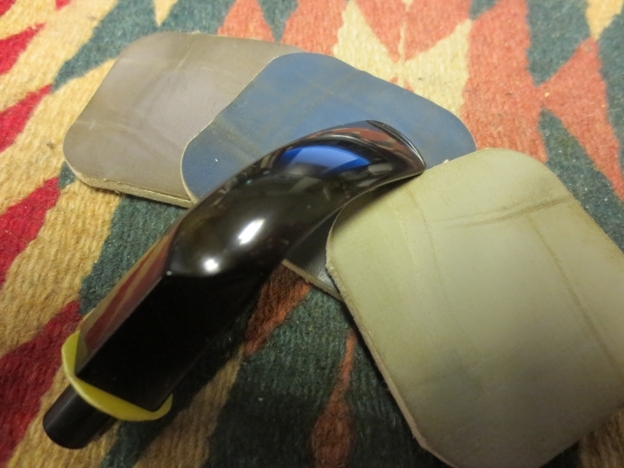 I rubbed down the stem between each group of three pads with Obsidian Oil and then moved onto the next set of three. 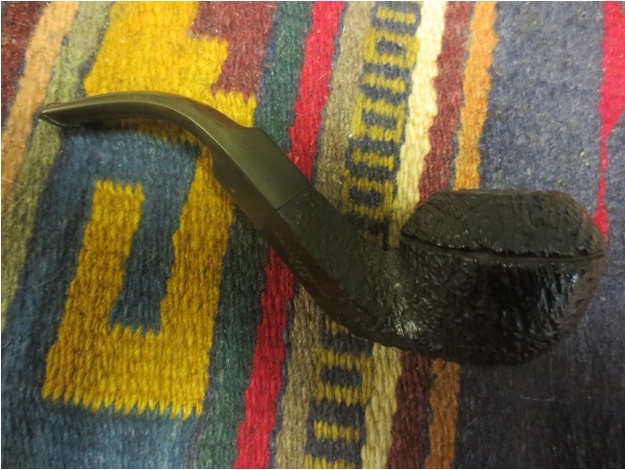 When I finished I buffed the stem with White Diamond and gave it a final coat of Obsidian Oil and let it sit until it had dried. 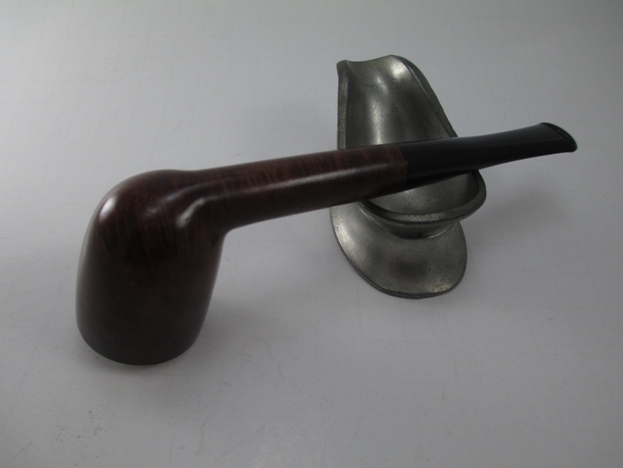 (NB In the photo below I left the plastic washer in place on the stem while in the two above I removed it for the photo) I put the stem back on the bowl and gave it a final buff with a blue polishing bar on the buffer. 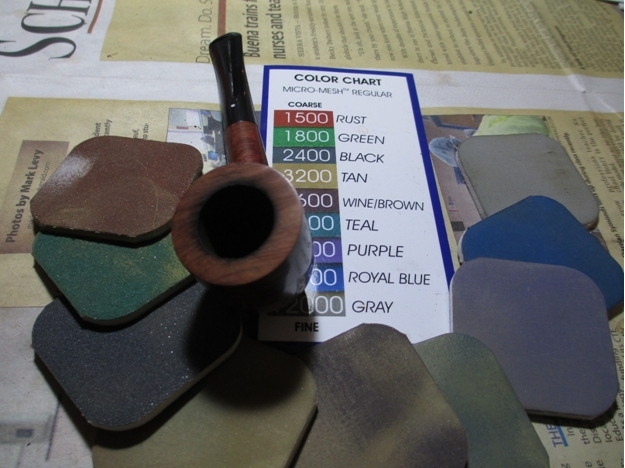 This polishing compound is a plastic polishing compound (Blue Diamond maybe, can’t remember the name). 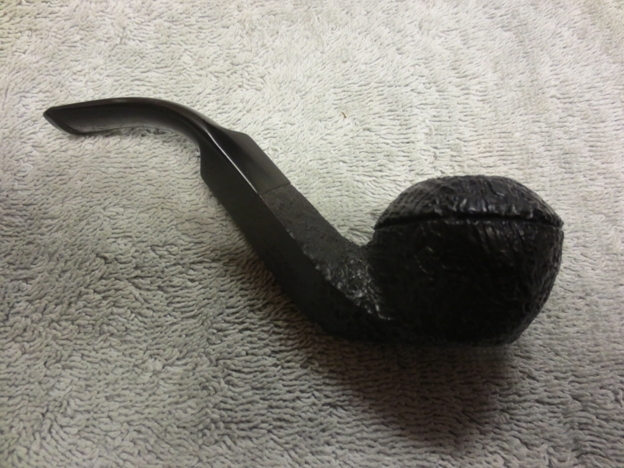 I finished by giving the bowl a buff of carnauba wax (light touch so as not to gum up the blast finish) and then multiple coats of the wax on the stem. 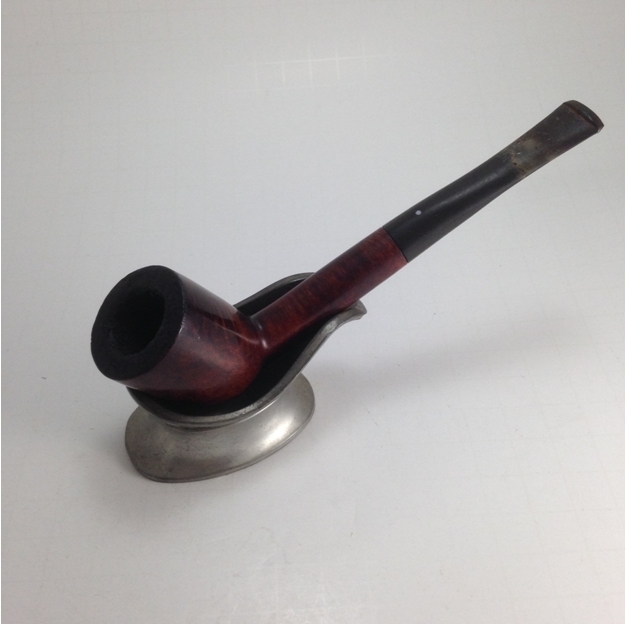 I buffed the whole pipe with a soft flannel buff for the finished shine on the stem and the bowl shown in the photos below. 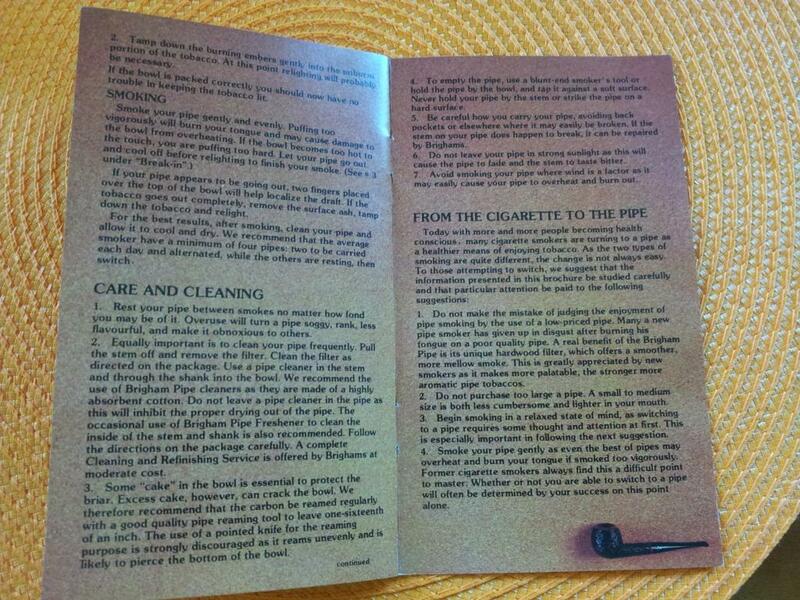 The pipe is ready to be christened with its inaugural smoke this afternoon while I go for a walk in the neighbourhood. 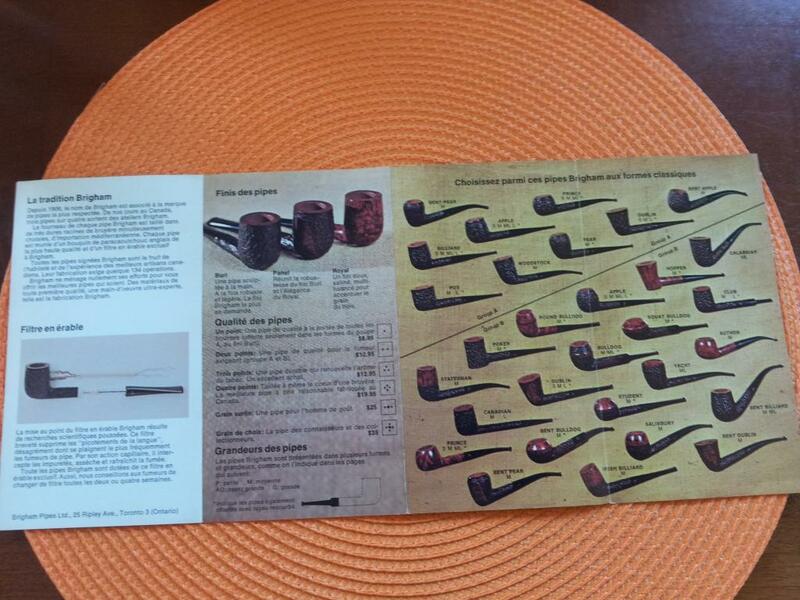 I have chosen a Virginia Perique blend called Pilgrim’s Muse that I purchased from the Country Squire Tobacconist. 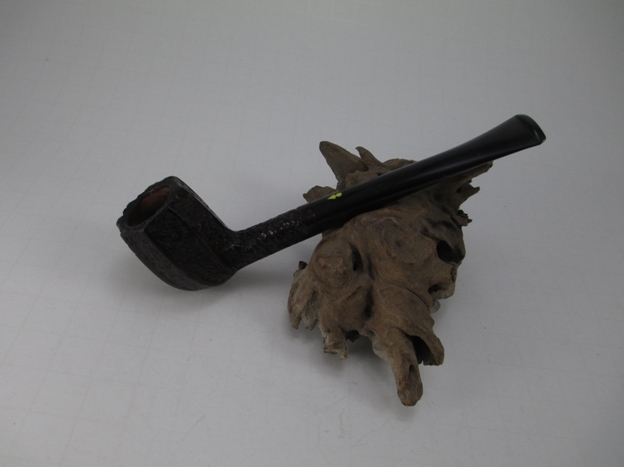 It is a great smoking tobacco with a good flavour. 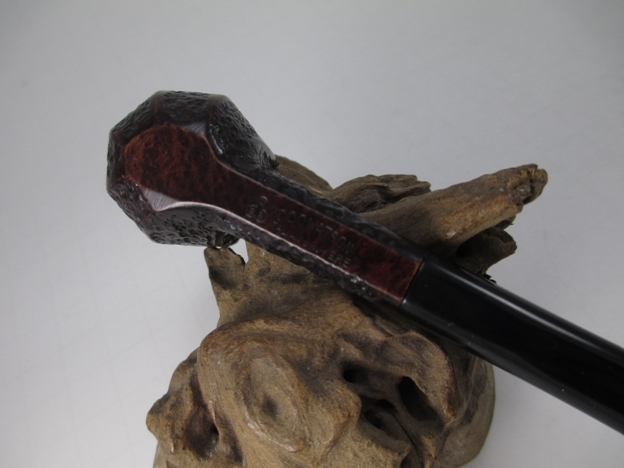 This entry was posted in Pipe Refurbishing Essays and tagged Bowl - refinishing, finishing, micromesh sanding pads, Oxidation, pipe refurbishing, refurbishing, removing oxidation, sanding a stem, stem work, Wally Frank, Wally Frank pipes, Wally Frank Sandblast, Wally Frank Sitter Pipe on December 14, 2014 by rebornpipes. 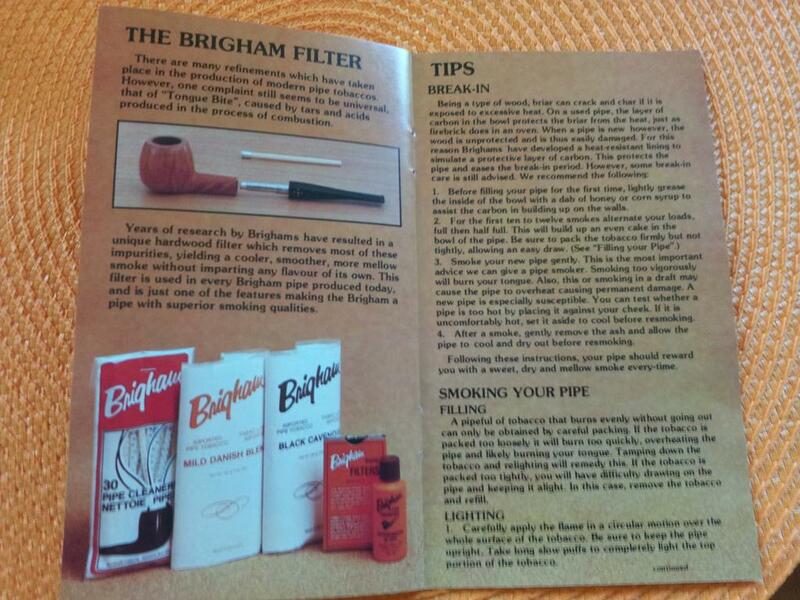 Bill Tonge, who has written several blogs for rebornpipes has become a big collector and fan of Brigham pipes. He refurbishes them and enjoys their workmanship. 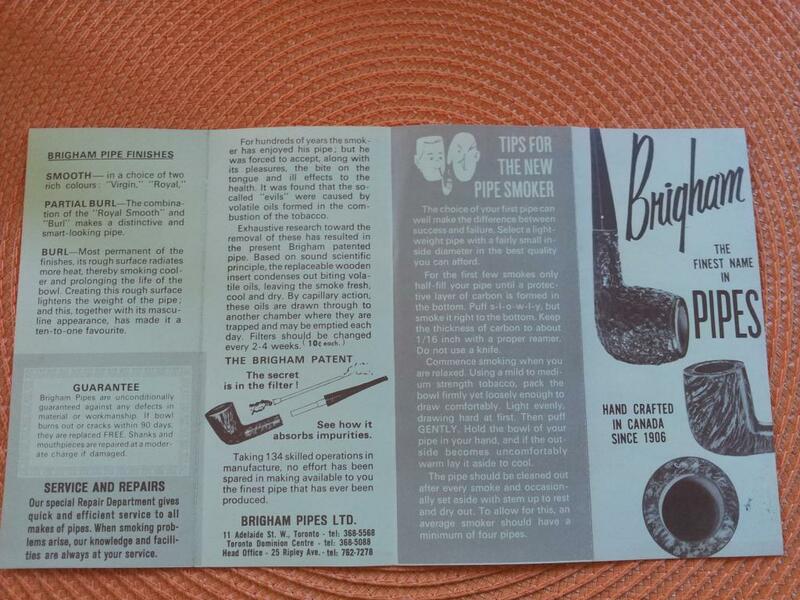 Several months ago he talked with Brian Levine, the US Brigham representative and received these brochures and sales flyers for Brigham pipes. When he told me about the collection I asked him to photograph them for me so that I could post them on the blog. What follows is that collection. 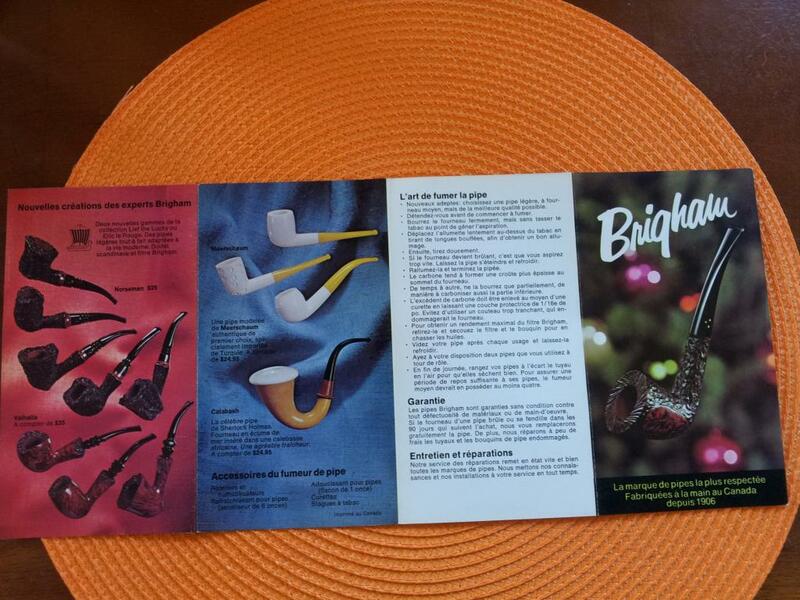 The text is hard to read in some of the brochures but the photos of the shapes and designs are amazing. 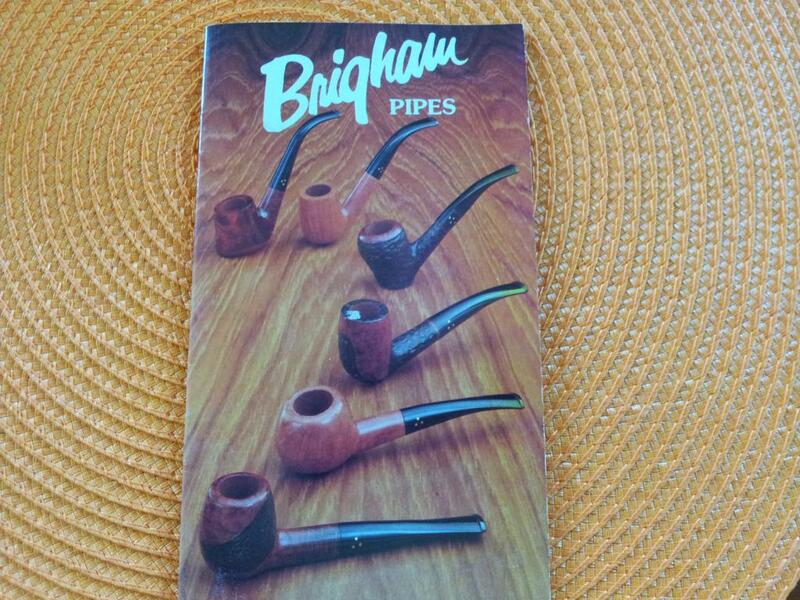 There are shapes in there that I have never seen and I have had a lot of Brigham pipes over the years. Enjoy the photos. 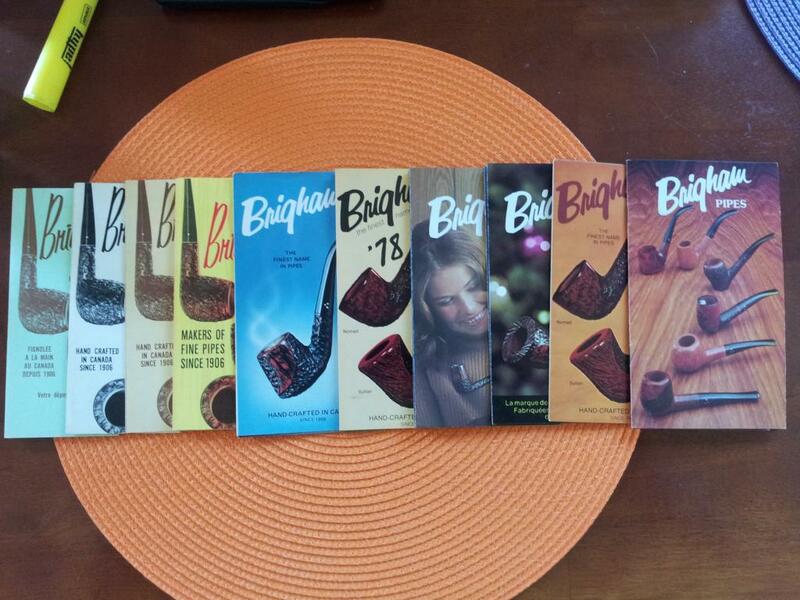 Thanks Bill for photographing these for us to read. Much appreciated. 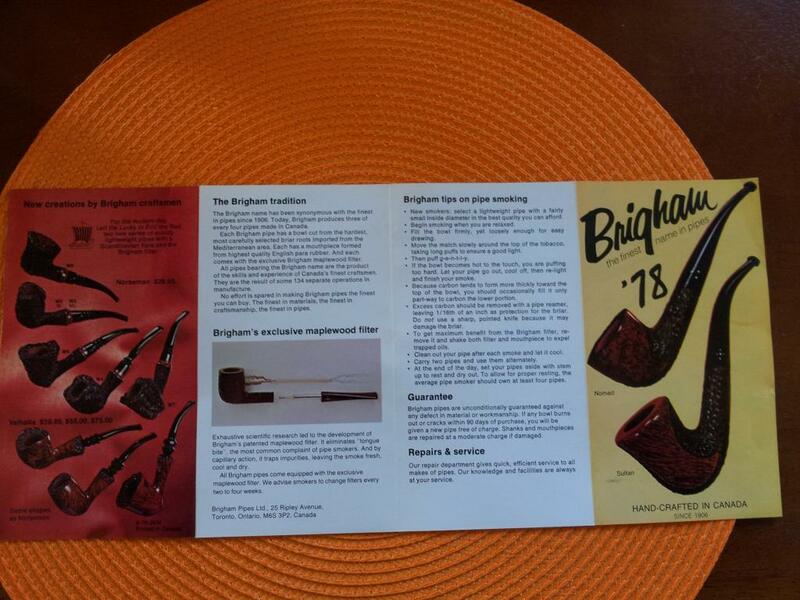 This entry was posted in Pipe and Tobacco Historical Documents and tagged Brigham Pipe Documents, Brigham Pipe sales brochures, Brigham Pipes, Brigham Pipes Material, Pipe and Tobacco historical documents, Pipe and tobacco history, Pipe and Tobacco leaflets on December 14, 2014 by rebornpipes.